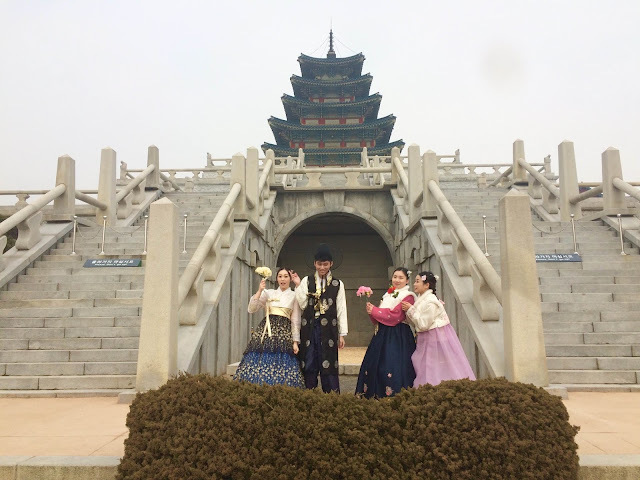 Eksena sa Korea is a series of my adventures, funny moments, and experience in Korea. I showed the printout of my hotel made at booking.com. I did not speak. Me: (now I know why) Am sorry, I am a Filipino, English please.. 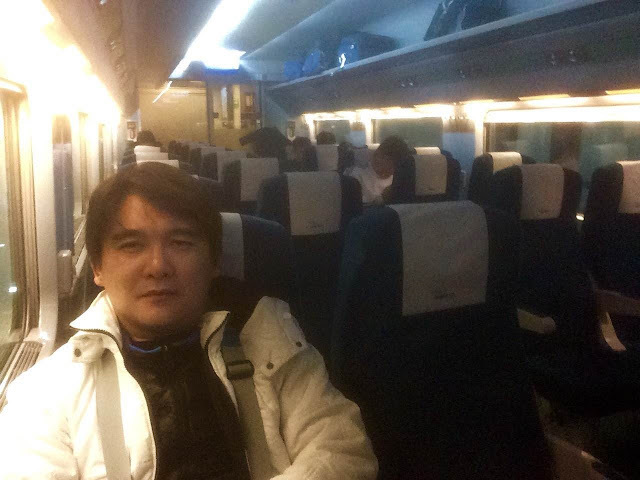 It was 5am and I had to rush to the KTX (bullet train in Korea). 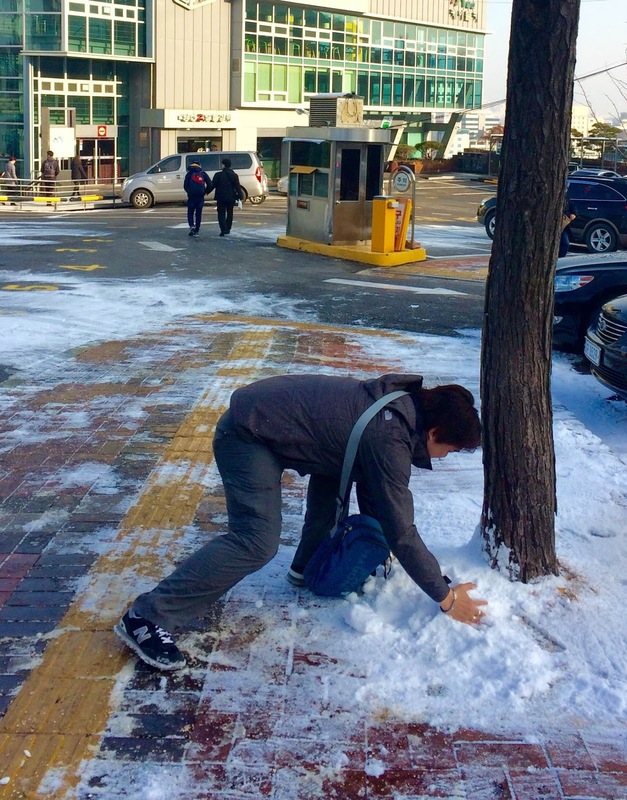 I arrived past 11pm, woke up 4am and took a hot shower while the temperature outside Incheon was -3. 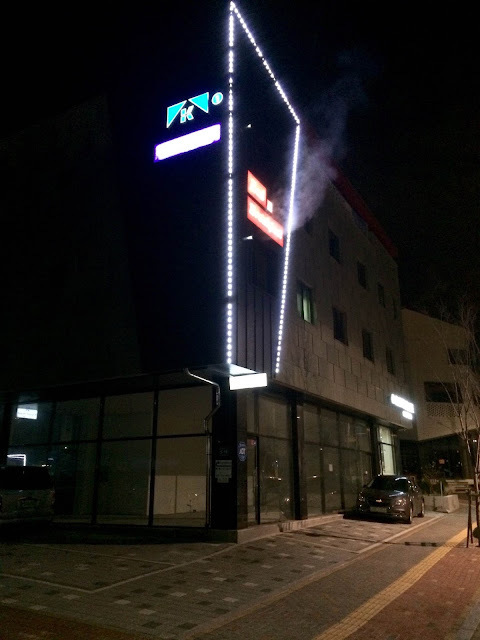 Anyway, I was freezing cold while I was walking towards the KTX station and upon arrival at the counter, I was told that it will open past 6am. Instinct told me that I had to eat first in order to have energy for the long travel ahead. And so I went to the convenience store. A guy was mapping the floor while I entered the store. I bought my meal and my coffee. Problem was I did not know how to operate the coffee machine and the microwave because it was in Korean. That afternoon I asked Youngjae Lee the Korean translation of "Thank You!" I have no idea if I will go to jail for this. But the movie has left a permanent scar in my mind. 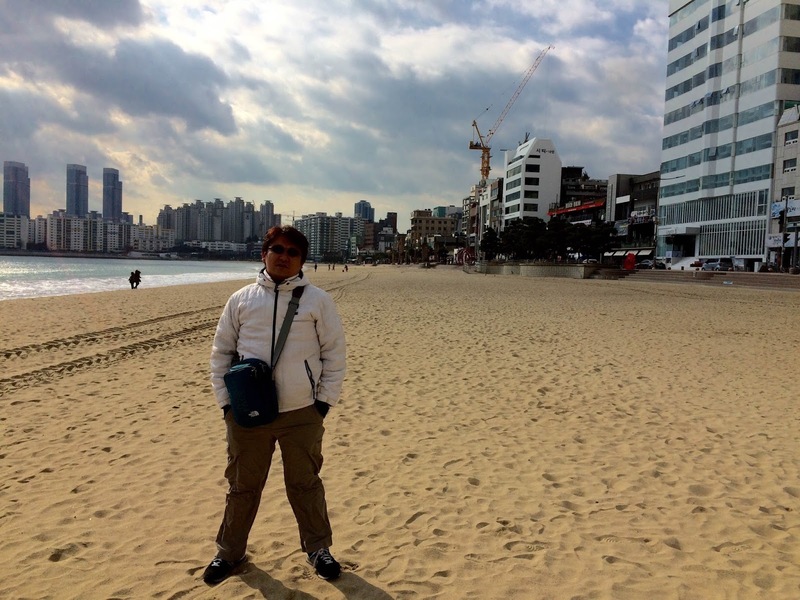 And I had to do it in Busan. 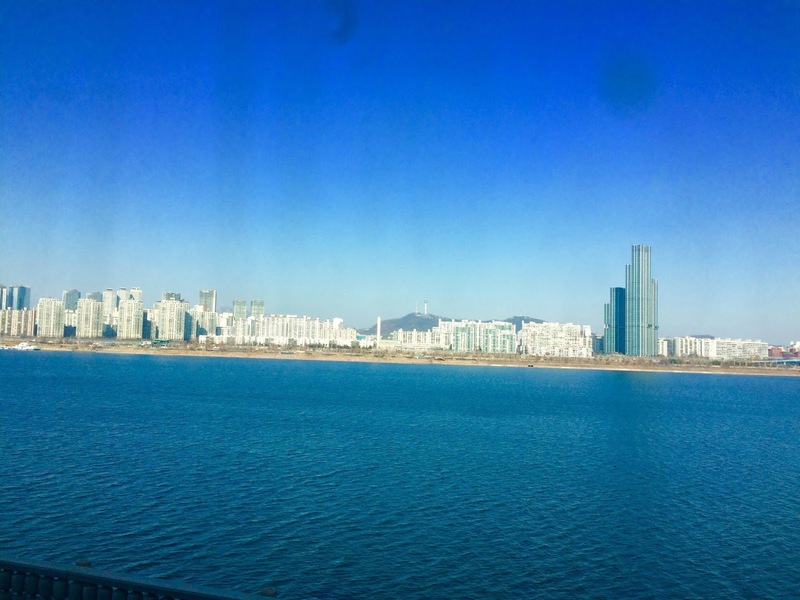 But when I was in Busan, I forgot all about it. From Daegu, I boarded the KTX to Seoul. The ride was good for almost 2 hours. I arrived at Seoul Station and asked for directions. But this time I was a bit slow getting the directions (I was tired) and so I ended up asking a lot of times and there was even a point when I was already exhausted and had to give up. Finally, after several attempts, I found the secluded hostel. 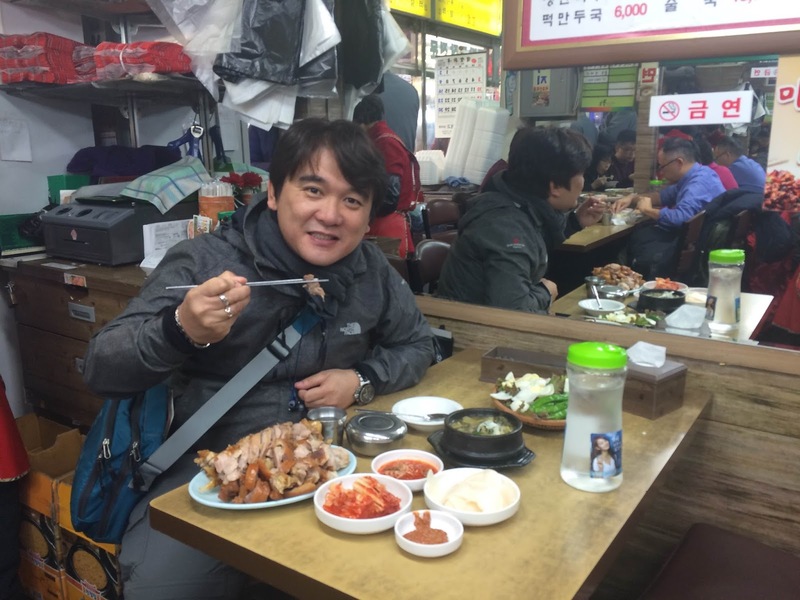 From the hostel, this time the endeavor was to find a place to eat. I WAS STARVING! And so finally, I was able to find one. I had to peek and from the view outside, there were lots of customers inside. One thing I learned in the Philippines is that if the restaurant is pretty much occupied by the locals you can be sure of two things - (1) price is cheap and (2) it tastes great! I was not able to understand the signage. For all I know the food here is REALLY GREAT!!! And with all enthusiasm and gusto, I joined the long queue. They appear to be without any means of support. I also noticed that they all have the same meal (they must really love this meal hmmm...it made me more hungry) . And these people were beginning to STARE at ME..
All of sudden, a Korean woman at the top of her voice was staring at me at shouting something (even pointing her finger at me). Of course, being a good foreigner, I did not retaliate and smiled back. I remained in the line. The people continued to stare at me. I did not mind it. But the Korean woman was getting into my nerves. She was still shouting! Hello!! My pera po ako! Magbabayad po ako!!! This is a feeding program for the homeless and the elderly!! 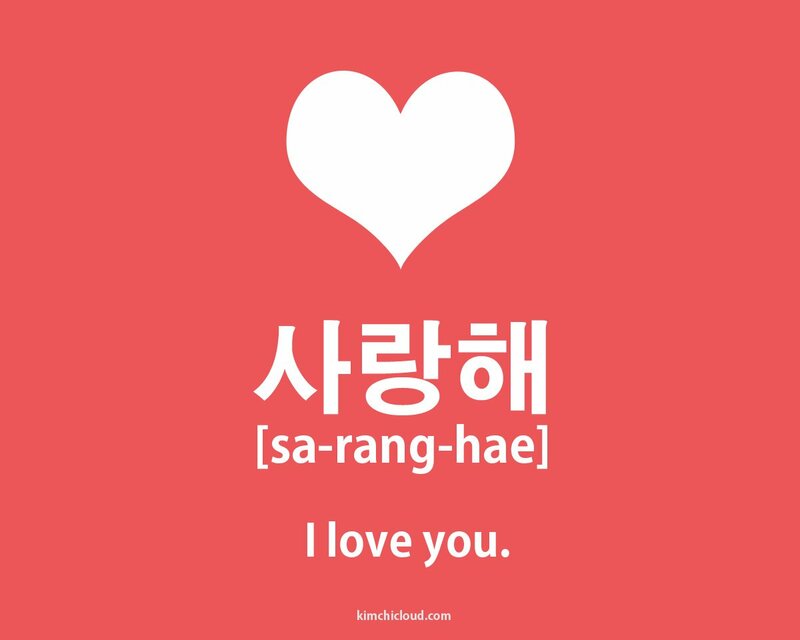 I looked at EVERYBODY and said - ANNYEONG ASEO!!!! 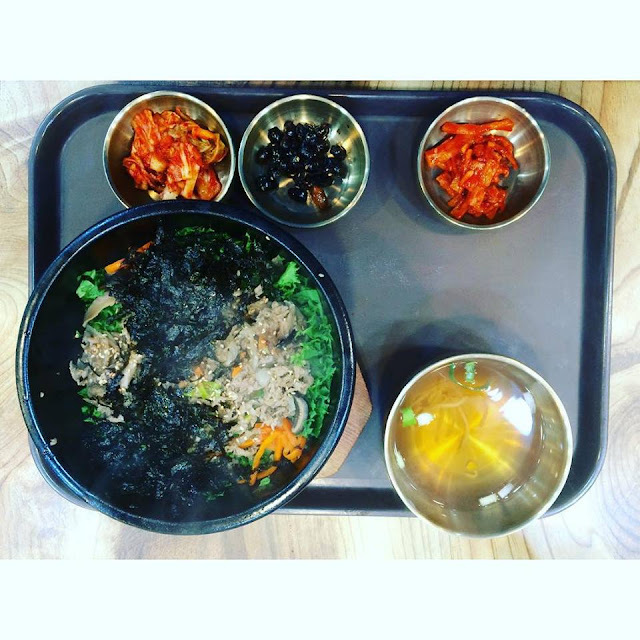 After my city tour, I went back to the mall and ordered my lunch. Everything was in Korean. 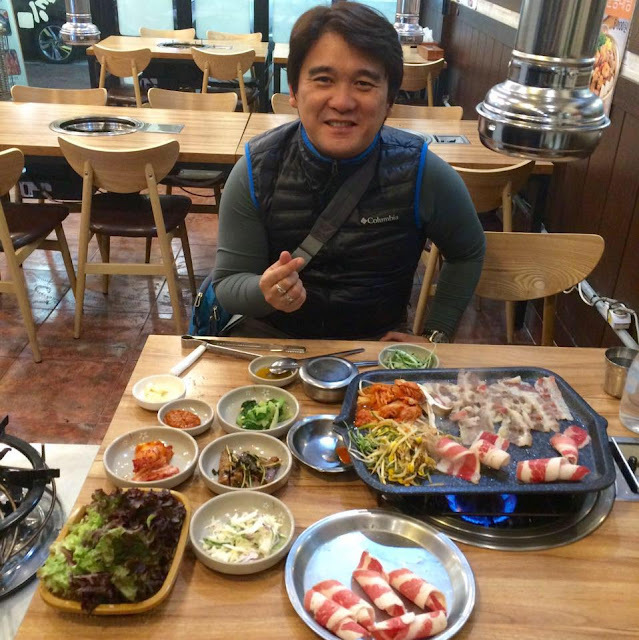 From the pictures posted at the wall of the resto, I tried to pic the best meal. Hmmm. finally, I was able to select one! I ordered and pointed at the meal posted at the wall. Problem was there were 5 pictures posted on the wall. And so from the counter, I had to walk back to the wall and point to the actual picture (while the rest of the customers were staring at me). The staff was able to understand and I said with "rice" (again pointing at a bowl of rice). After 10 minutes of waiting, I was called back by the staff (you have to get it from the counter and after eating you have to clean it on your own). I seated. Looked at the meal and noticed that there was NO RICE! I asked the staff at the counter. On my 6th day in Korea, I booked, enjoyed, and finished the Seoul City Tour Bus with 22 stops. 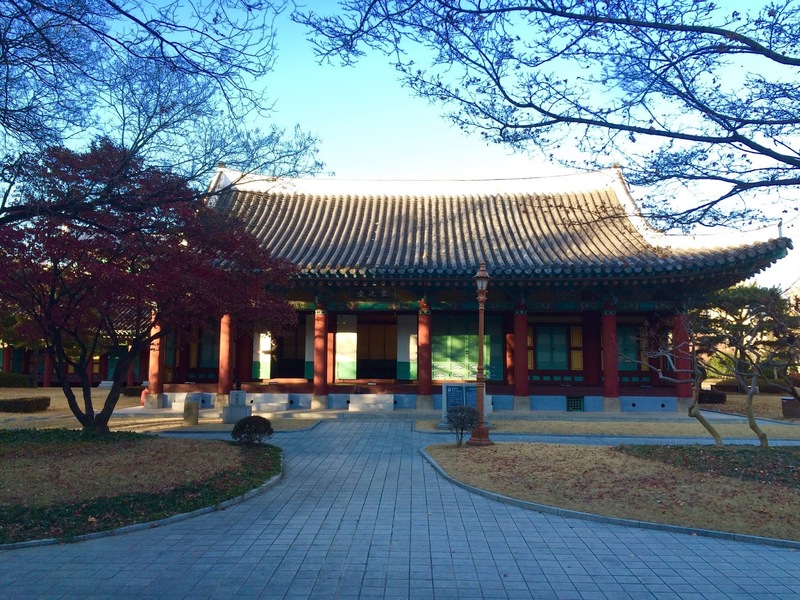 Last stop was the biggest palace in Seoul (it is very difficult to either say it or write, please do not ask). Anyway, on with the story. Across the entrance of the Palace, a lot of people were celebrating something. 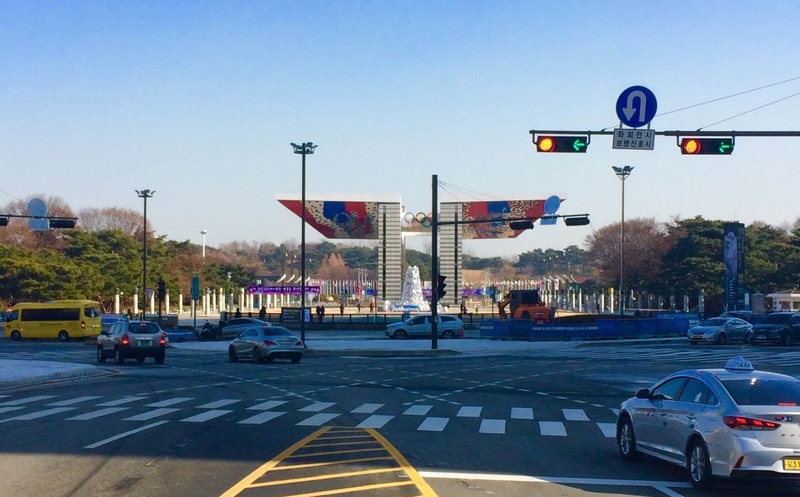 Out of my curiosity, I walked across and saw people holding the flags of United States and South Korea. Without even asking what the occasion was all about, I joined the parade and marched with the Koreans. 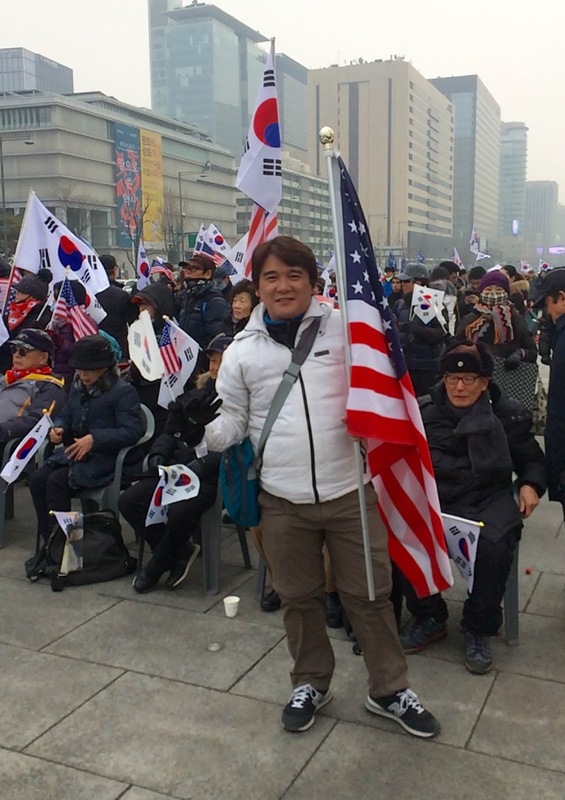 I had to ask for my own Korean flag as I strolled along the park with the Koreans (blending with the crowd). 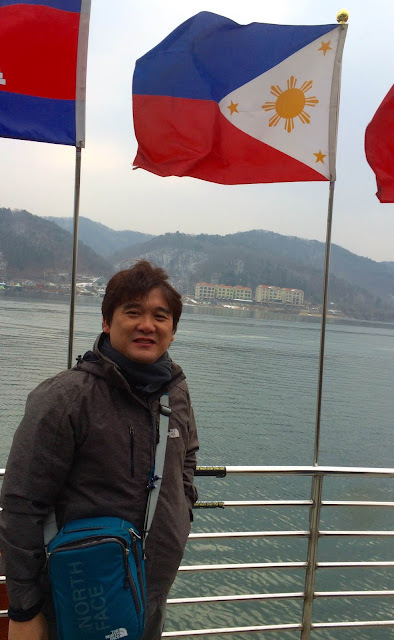 The Koreans were repeatedly shouting something and waving the flags and as an obedient follower, I tried to shout what they were shouting (without understanding what it meant) and likewise waving my own flag. I noticed that majority of the participants were war veterans. After nearly 10 minutes, coffee was served and meals were given to participants. I joined the queue and ate my "fair" share of the meal. Sumigaw din kaya ako! Note: The day commemorates the men and women who died while in military service or in the independence movement. On this day, a national commemoration ceremony is held at the Seoul National Cemetery. 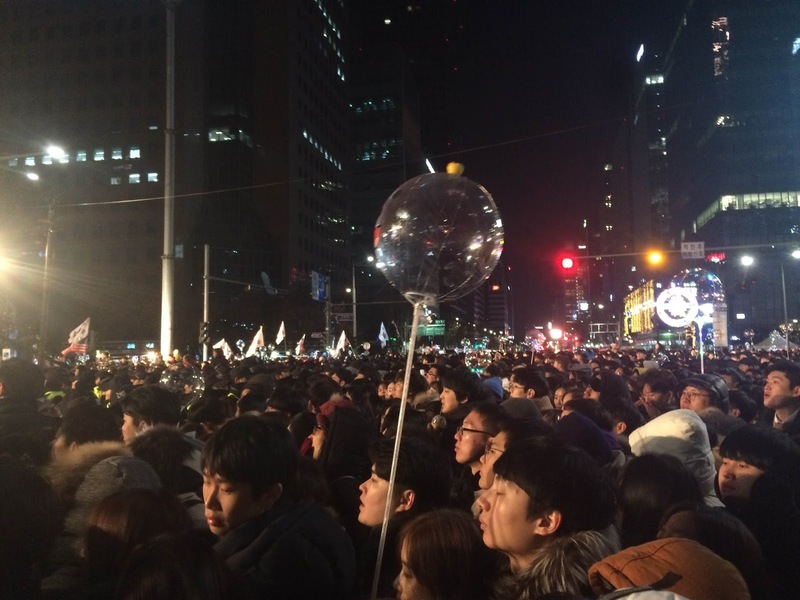 The day celebrates the promulgation of the Constitution of the Republic of Korea in 1948. 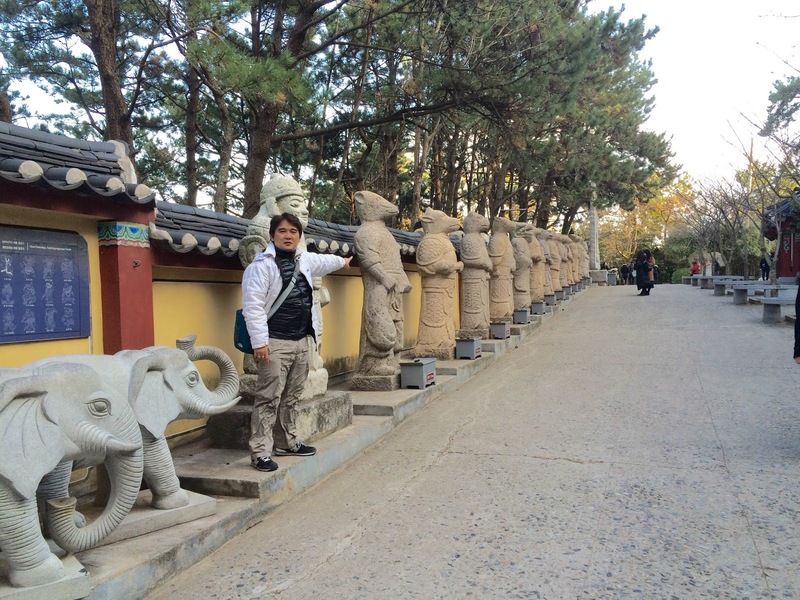 Breaking one's heart - "EXO"
I was happy I was able to finish early on my 6th day of my tour in Korea. I hurriedly went home and did blogging and posting in my facebook and instagram. Past 6pm, I remembered something!!! OMG! I forgot my niece's request (also inaanak) to buy her something and I scheduled it today. I again hurriedly fixed myself and out of nowhere it was raining (mixed rain and snow) and the temperature was dropping to 1 degree. I had to this! Against ALL ODDS! 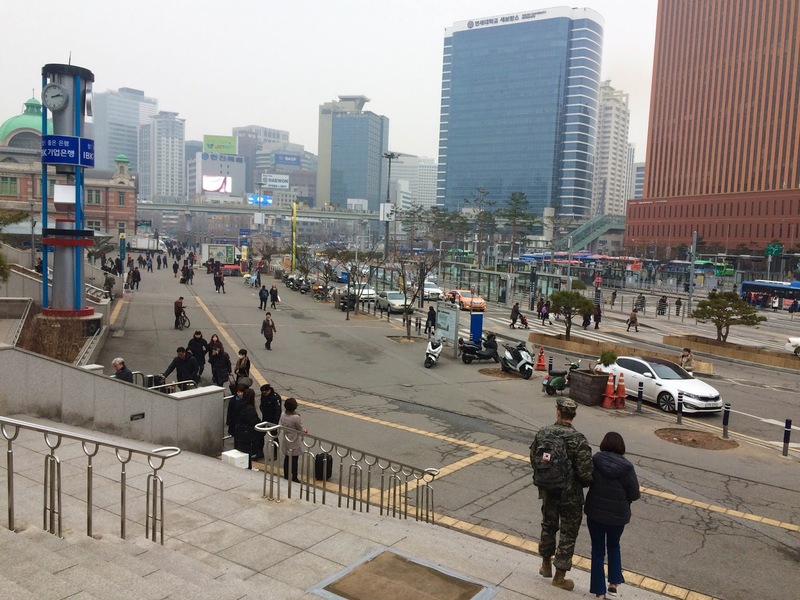 To make the story short, I went to Seoul Station and asked for directions on how to get there. After given the direction, I went to Exit No.2 and proceeded walking to Line 4. It took me more than 10 minutes before I reached the track. From Line 4, I boarded the train and alighted after 6 stops (or after more than 15 minutes onboard the train). I had to change Line and proceeded to Line 7. Again, I walked and this time it was more than 10 minutes. Reaching Line 7, I boarded the train and alighted after 7 stops (or more than 15 minutes). I walked again to Exit No. 6. And it was raining outside! I asked for directions on where SM Entertainment and after asking a good Samaritan, I was told of the precise location. 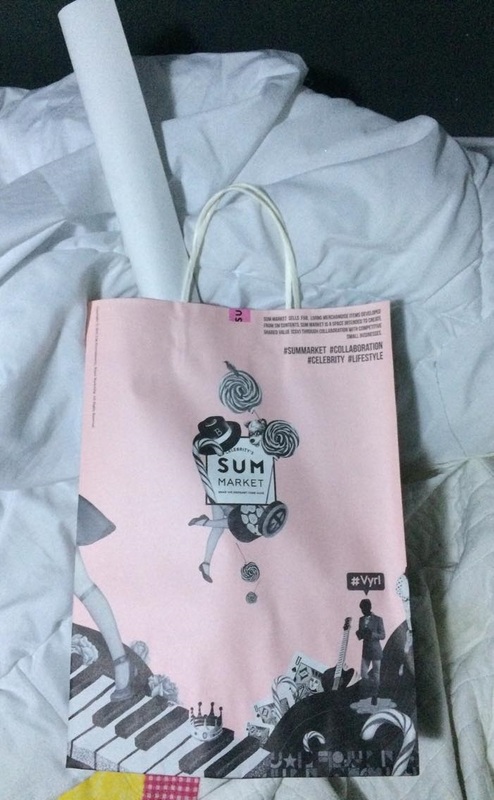 Finally, I reached SM Entertainment and went to Sum Cafe. According to the instructions given by my niece, I have to go the cafe and asked for a "free copy of the album of Exo - Universe! Yup, You got it right! It's K-Pop! She told me that it was given for "free." I went to the counter and hesitantly asked for a free copy of the album of EXO. 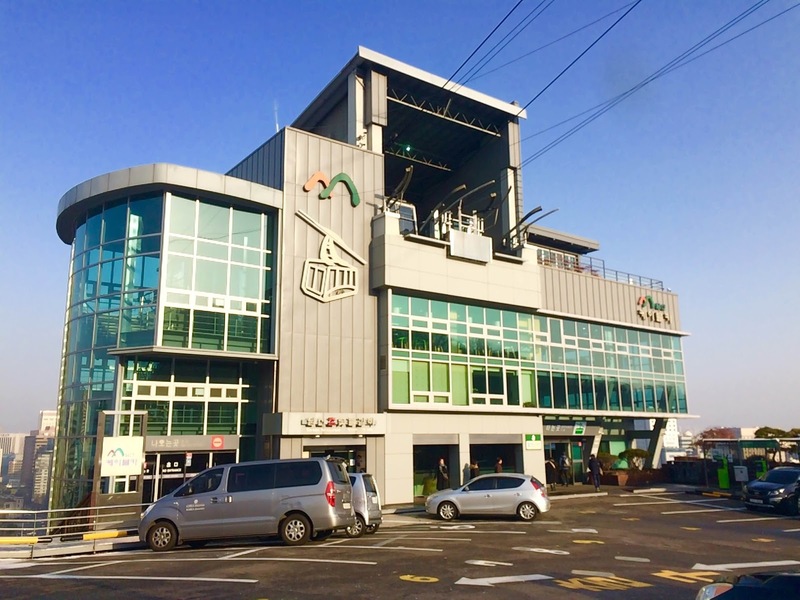 At first, the staff was surprised about my request and after coming to her senses, she pointed to the Sum Market situated at the basement of SM Entertainment. In other words, IT IS NOT FREE! If you were in my place would you buy at the market downstairs? I did not want to break the heart of my niece and go home empty-handed. I bought the album (and even got 2 free posters). 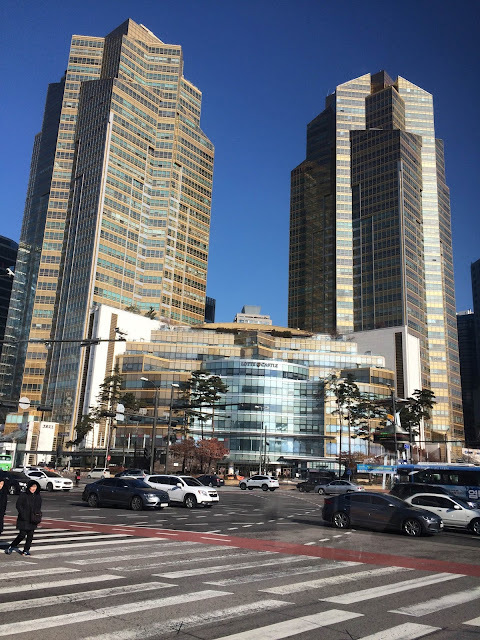 Exiting the store, I noticed that there was a multitude of Korean teens looking at a glass with all their cellphones' camera pointed to the glass. I guess a celebrity or a singer was inside. I tried to join the crowd but I remembered my cargo. It might be destroyed in the process of squeezing my way into the crowd. I decided to go home. Walking again in the rain... But this time the smile was written all over my face. I told myself - "I will make someone happy in the Philippines." And I placed the package on my chest so that it will not get soaked in the rain.. I was doing my review about Special Laws in the CPA Board Exam for May 2018. 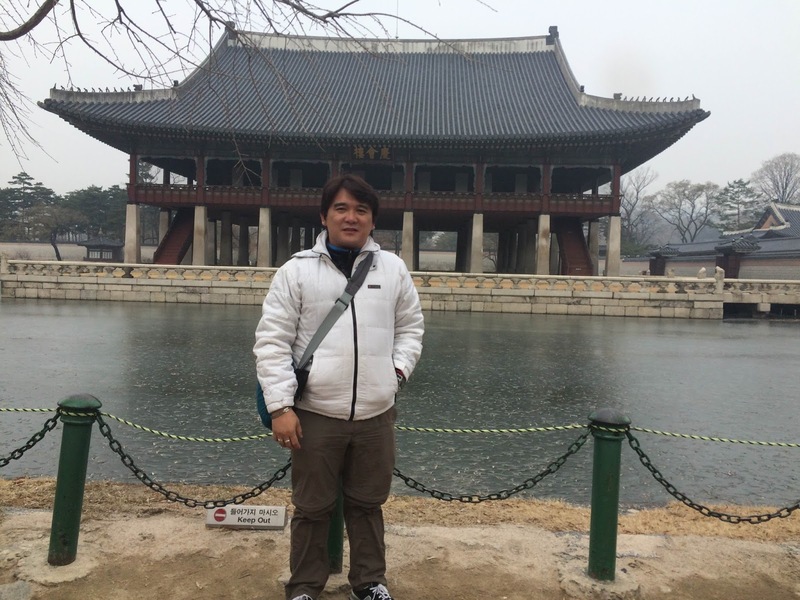 During the short break, I was approached by one of the reviewees that he recently went to Korea last November 2017. He was kind enough to give me his reloadable card and told me that it still has a balance. He gave me tips to buy an inner wear in Uniqlo and a lip balm for the cold weather. 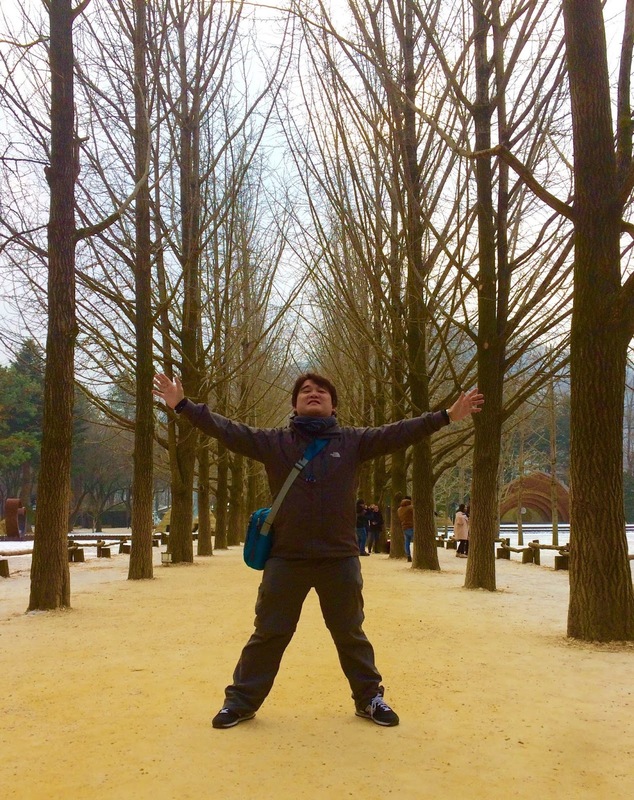 Three days before my flight, I was able to buy an inner wear for the cold weather. But forgot the lip balm. The day before my flight, I went to Waltermart Tanauan and went to Watson to buy one. I told the saleslady to give me the cheapest and I was so happy to get one for only PhP69.00. I placed it in my pocket and then at home placed it my Deuter bag. I woke early morning and because it was -2 around 4 am. I had to put the lip balm. I told myself - "Dapat madami nito para effective"
As I was passing the crowd, onboard the train, I noticed that the people were taking a glimpse of my face! Oppa! At first I was flattered. But I saw my face in one of the mirrors on the train. 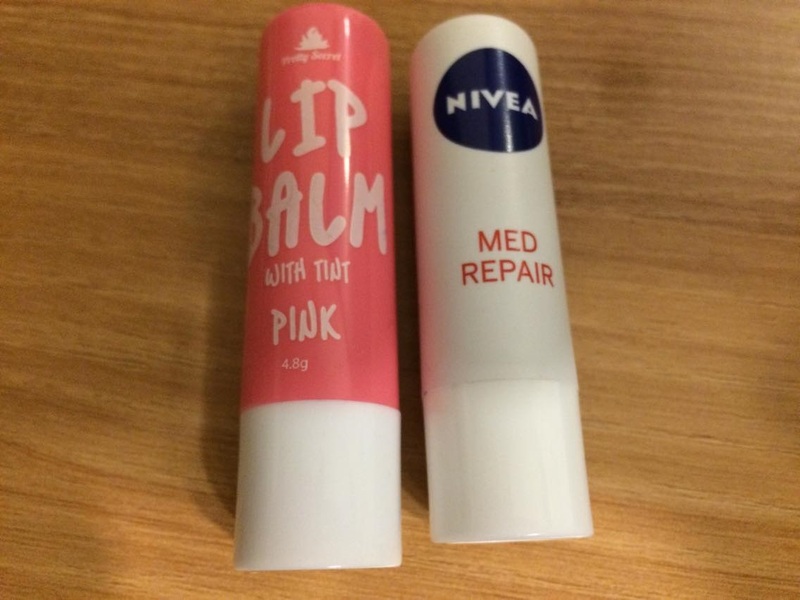 My lip balm is colored PINK!!!! And I placed too many on my lips!!! As in ang kapal! Note - I bought another one in Busan but this time the cost was KRW 2,500 or roughly PhP250.00. 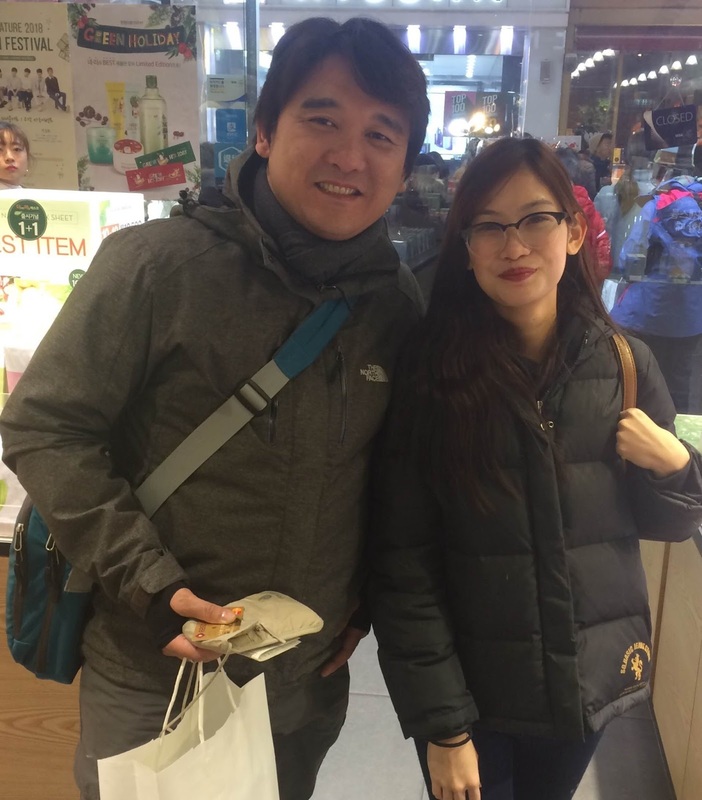 Day 4 in Korea, a former student gave me a hint on buying something in Seoul and selling it in the Philippines. I told myself - "Why not?" I saw an outlet store and remembered the proposal and with a positive outlook, I tried to make an inquiry. 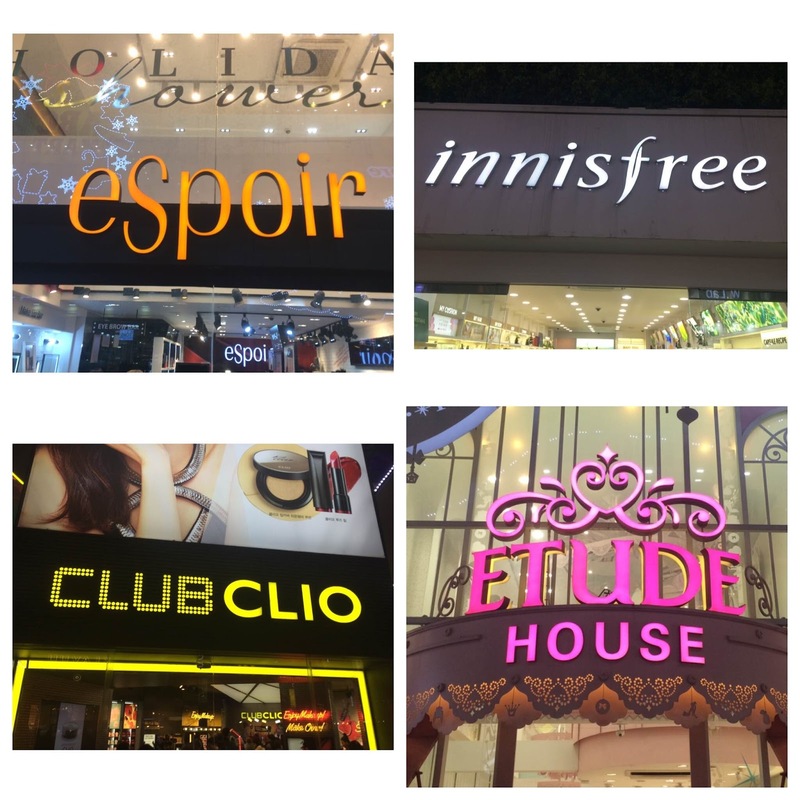 The saleslady asked me what brand, color, shade and size. She was asking so many questions. Hindi naman ako gumagamit nun! Lip balm nga mali na, LIPSTICK PA! Hindi na ako magbebenta ng LIPSTICK! 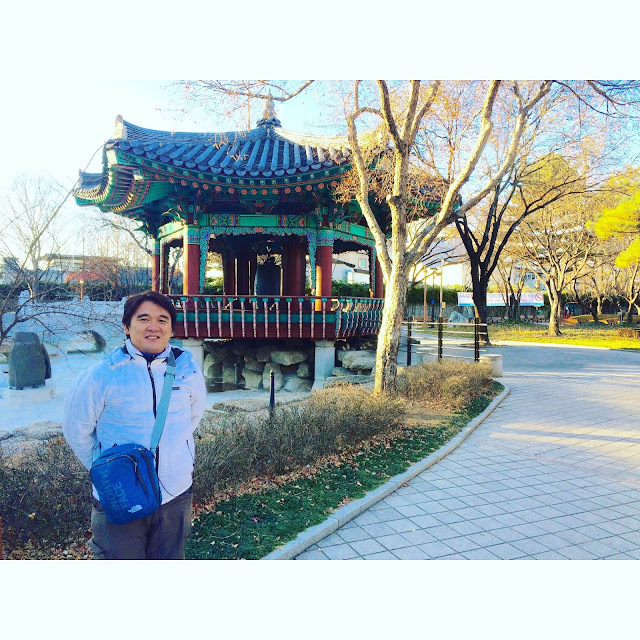 Seoul is one of the famous cities (if not the most famous) in the Philippines. 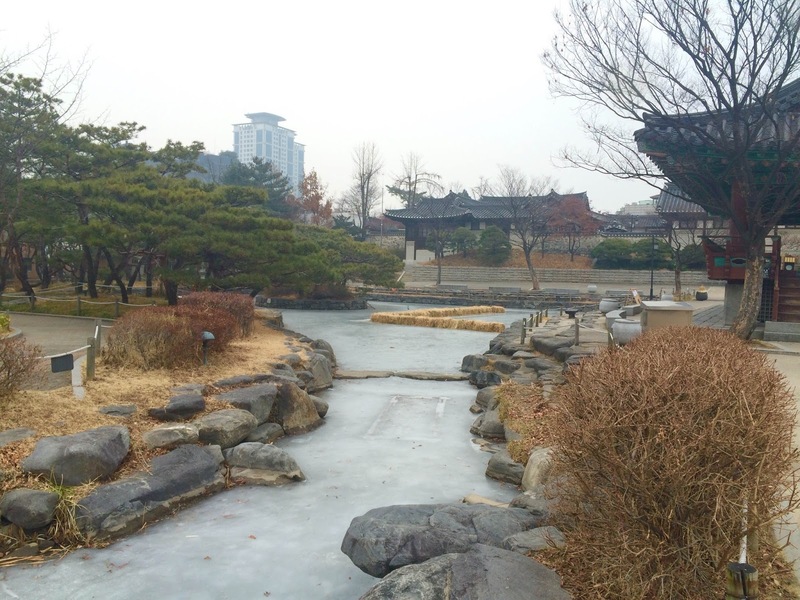 My visit this 2017 was the second time I was given the chance of seeing Korea anew. 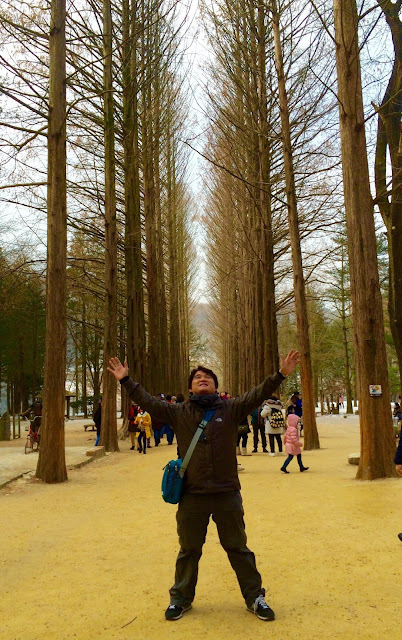 This time I had more time and places to visit. I went to Namdaemum Market (after going to SM Entertainment in Cheongdam Station to buy the EXO album). As I was walking to the tunnel. It was raining. Mixed rain and snow. I saw a man fixing something. In fact, as I proceeded further, I saw a handful of people doing the same. I hurriedly went to the market. And to my disappointment, the stores were already closed. 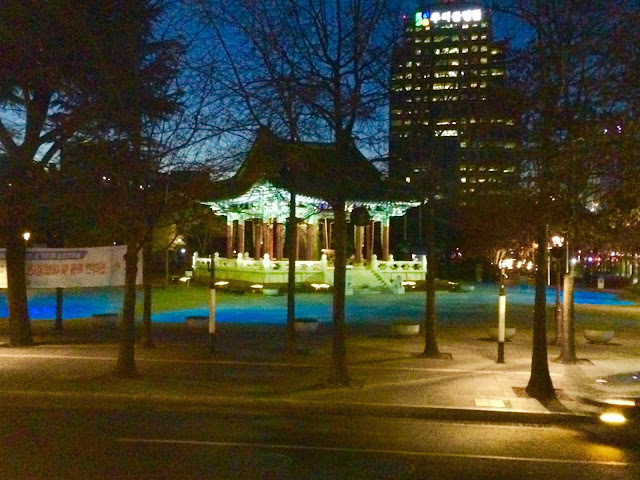 There was no night market. It was my intention to buy something as a souvenir. After 5 minutes of walking, I reached the tunnel again. The people are gone and all I see are small make-shift houses. I felt ashamed. I was disappointed for not buying the souvenir item and these people needed more. A cold tear fell as I was walking back to the hotel. Some sort of small package was given to me by a Korean. I gladly accepted it without knowing what it was. Back in the hostel, I opened I opened it. I was a bit hungry. Excited to see what was inside. OMG! It was some sort of sand. I tried to read the content and markings but it was in Korean. After a minute, it became hot. A day after, I saw a signage in English in a convenience store - "HEAT PACK!" I did buy some in Myeongdong but as a sort of pasalubong for my sister-in-laws and nieces! Do not worry! I did not try one. I was with a former student from FEU. She helped me select the shades and brands! It pays know something new - 'lipstick." My flight to Manila was scheduled 2:30 am, January 2, 2018. 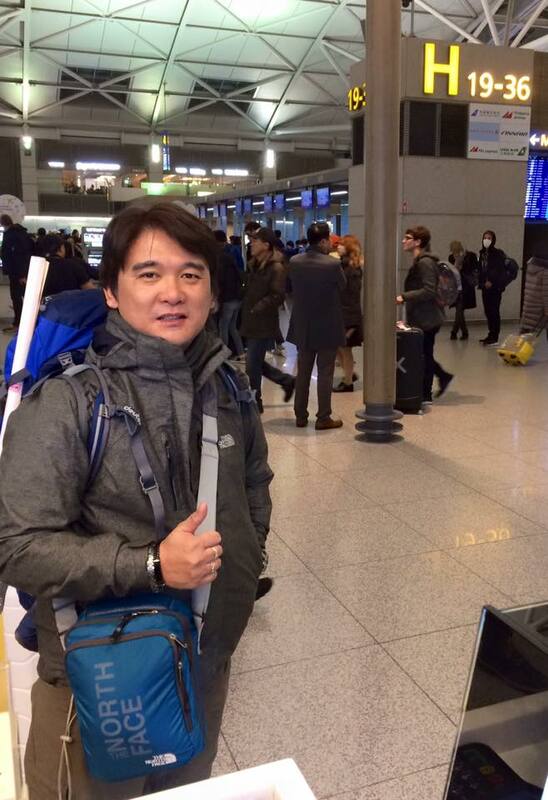 Being a punctual person, I arrived at Incheon Airport past 3pm. I watched all the possible presentations inside the airport since it was New Year. Past 7pm, people started to queue and I was told that there was a change in schedule of the flight and so I also joined the line. While in the line, I learned that there was a 10:30 pm flight (last flight for January 1, 2018) and the 2:30 am flight. I still joined the line with several options in my mind. 2. Plan B - Pay the corresponding fee for the change of flight. 3. Plan C - Ask for an early check-in so that I could buy at the duty free shops inside the boarding station. Finally, after 30 minutes, it was my turn. Everything did not work out. DISAPPOINTED. I asked the resumption of the check-in and I was told that the next one will be 11pm. As early as 10pm, I already joined the line. While queueing, I was talking to one of the passengers about my earlier predicament. Co-Passenger: "Good thing you were not allowed! Last time I was in South Korea was way back in 2011 when selected FEU teachers made a courtesy visit to FEU Korea. 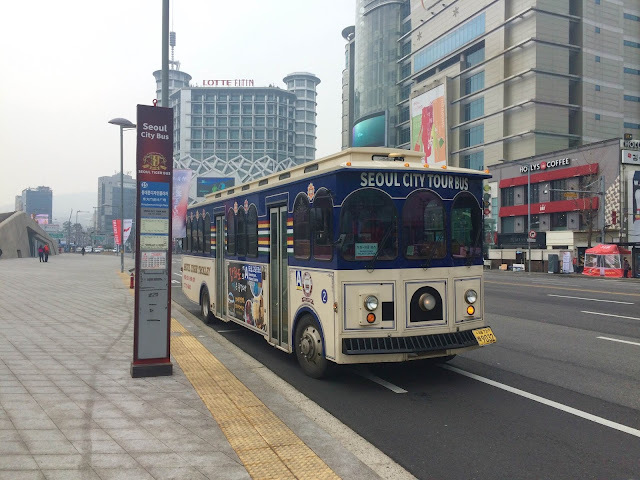 Since it was sort of a business trip, we had limited time touring around Seoul. And after six years, I'm back for 8 days. Again, as always, I boarded a Cebu Pacific flight (originally to Busan but was transferred to Incheon). I arrived past 10 pm and the temperature when I arrived was -1. I was so cold and the hard part of it is that I had to locate the hostel in the freezing temperature. I had to board the local train to my hostel and walked around and searching for 20 minutes before locating it. The name of the hostel is K-Guesthouse Incheon Airport Town 1. 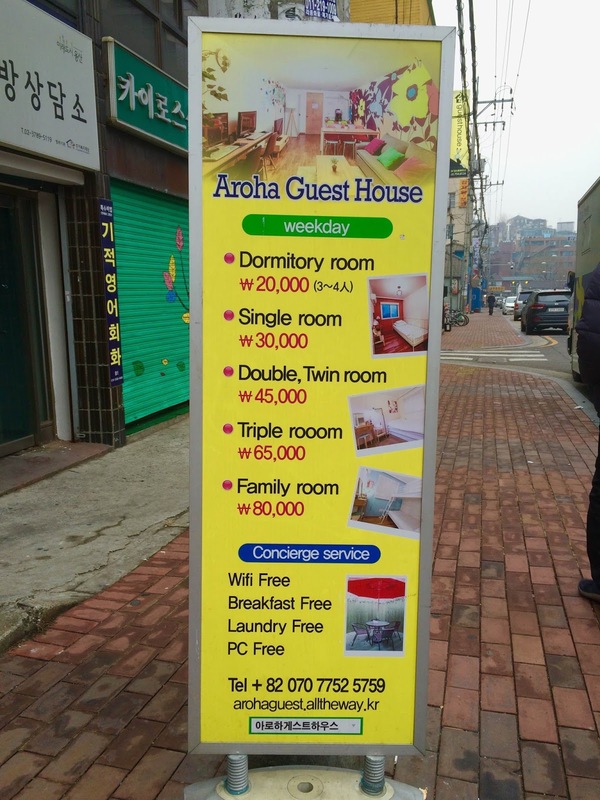 The price for one night stay is KRW 29,000 or PhP1,347 in a single bed in a male dormitory room. Tip: Best rate for the currency exchange is at the Incheon Airport or at Nami Island. They both accept US dollar and Philippine Peso. I woke up early the following morning in order to catch the first KTX trip to Busan. The fare is KRW 72,100 or PhP3,605. 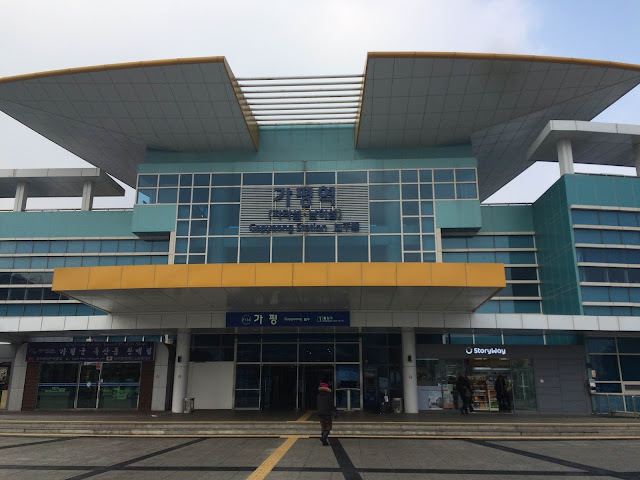 It is the fastest way to reach Busan and in just 3 hours and 40 minutes, I reached Busan station. 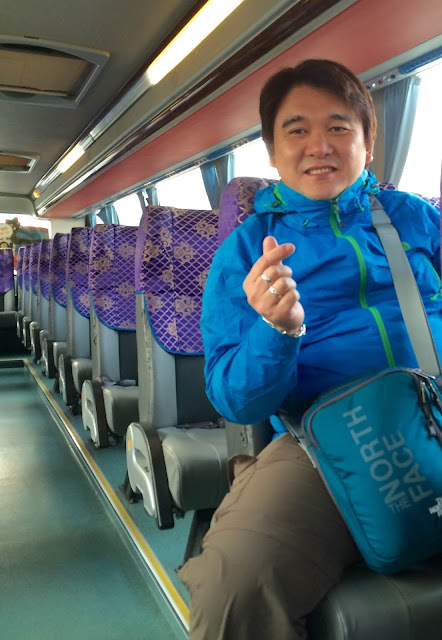 Tip: You can use bus or the local train but it is a long trip. 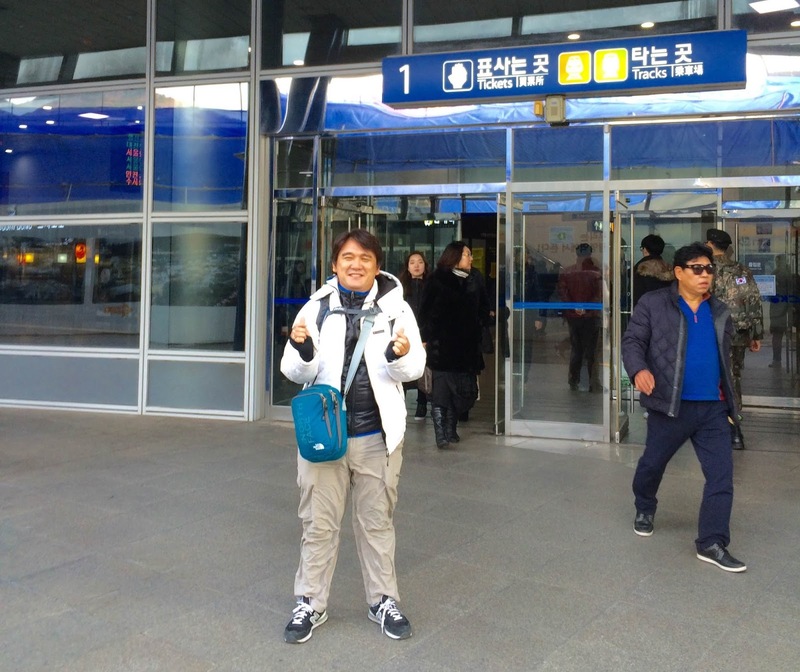 Youngjae Lee, my former Korean student who resides near Busan, was kind enough to fetch me at the Busan station. The first thing to do then was to find my stay. This time the name of the hostel is Top Motel Busan. The fee is KRW 47,000 or PhP2,183 in a standard double room. 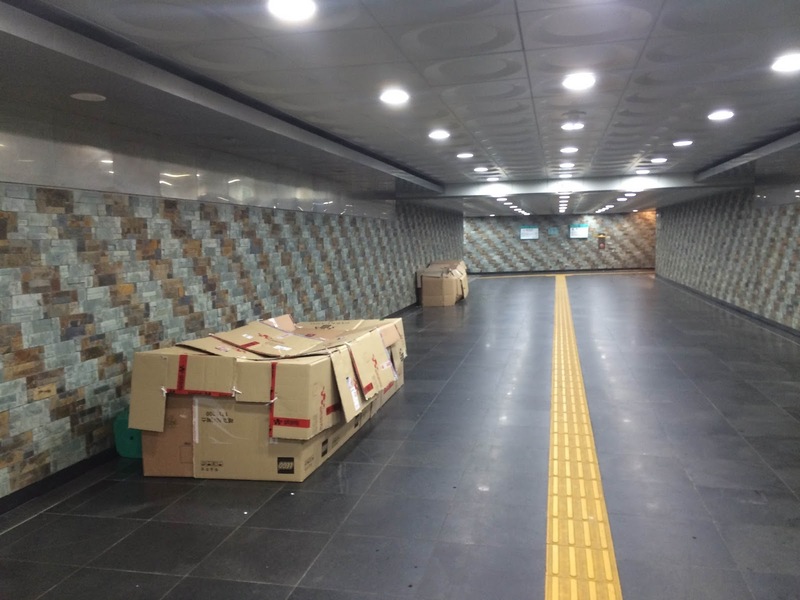 The price was a bit expensive but it was just 100 meters from the station and the amenities were great! It had everything such as television, personal computer, bath tub, wifi, personal accessories, etc. 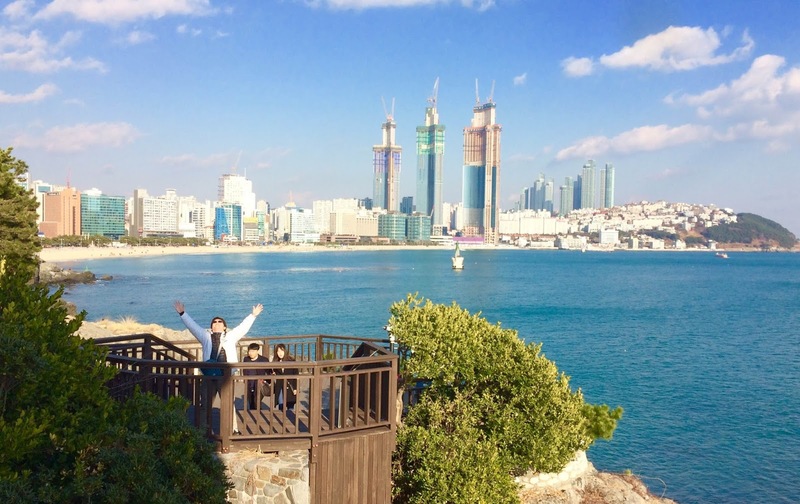 After my check-in, the only thing to do that day was to enjoy the Busan City Tour. 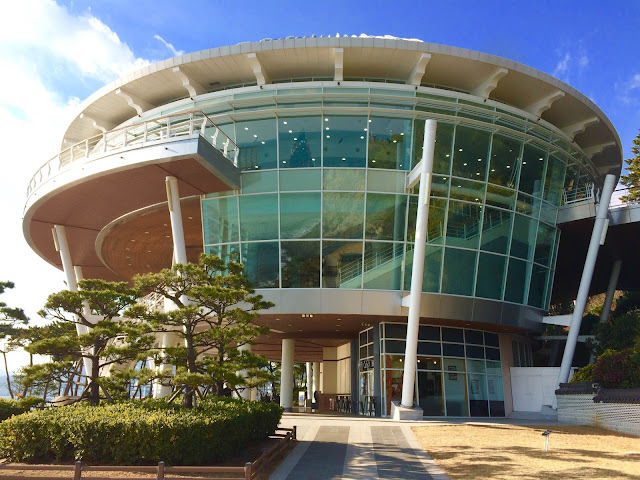 We paid KRW 23,000 for two persons (KRW 13,000 for 1 pax) for the Busan City Tour at a discounted price since I used the KTX train. First Stop was the Gwangalli Beach. 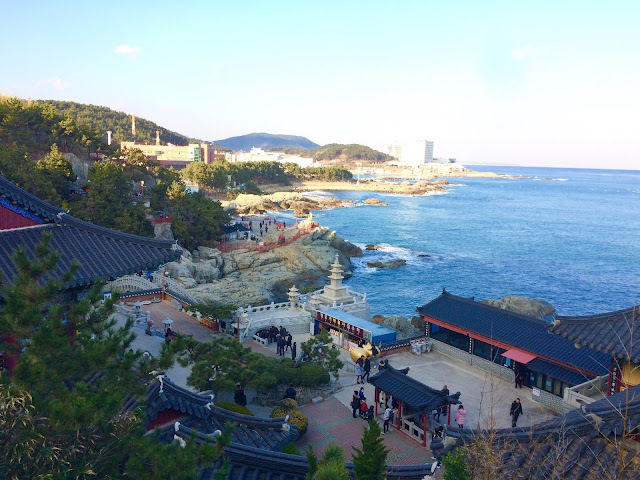 We took our lunch at the same beach and then proceeded to Dongbaek Island. This was the venue of the APEC in 2005. 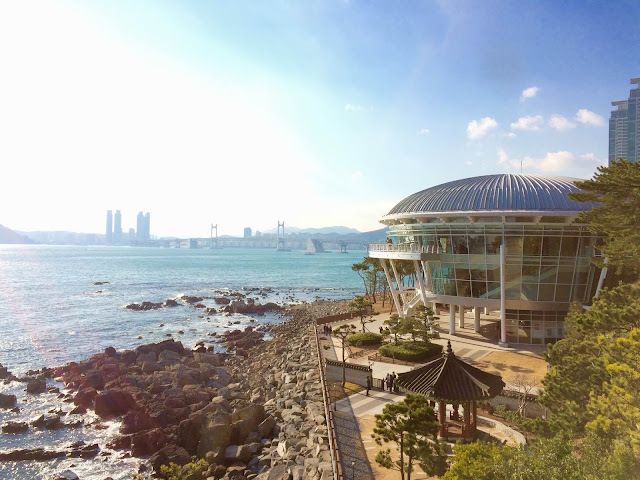 This is one of the best places to visit in Busan. 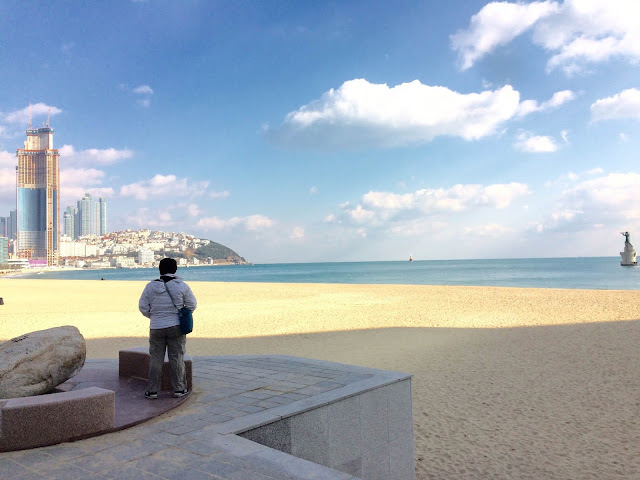 At the other side of the island is Haeundae Beach. 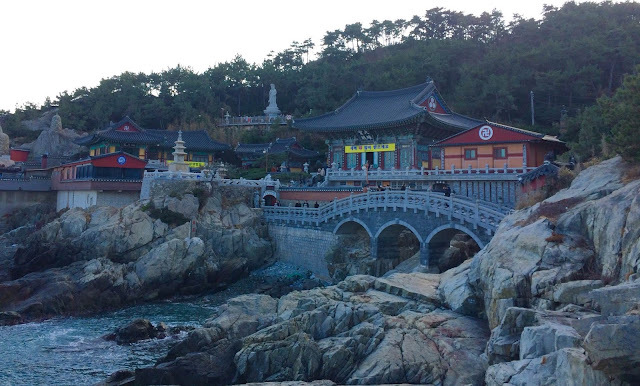 We were leaving the island when the mother of Lee fetched us and brought us to a temple. The feeling was as if I was in a movie. It was a scenic view! 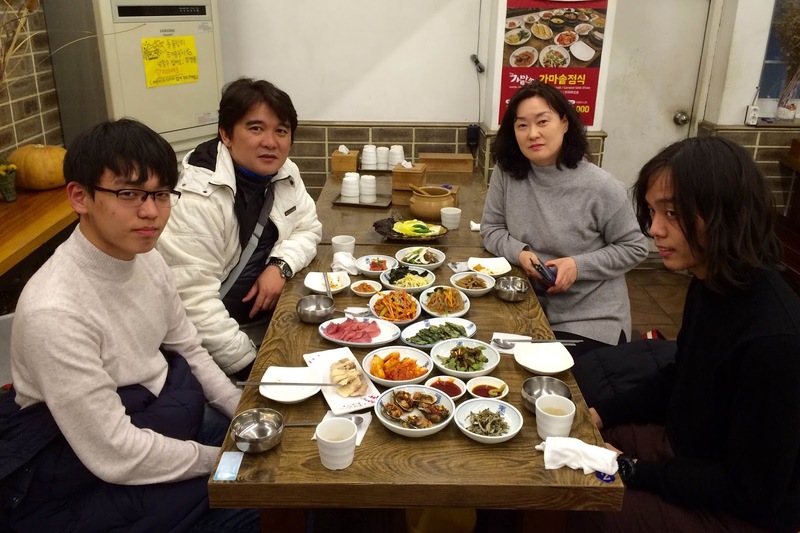 We were parting ways when Lee's mother offered dinner. Thank you for the sumptuous dinner. I am honored and delighted to have met your family. The following morning, I stayed in the hotel and enjoyed its amenities. Past 11 am, I checked-out and went to Daegu using the KTX. The ride was good for nearly 45 minutes and I paid KRW 17,100. I did not have difficulty finding my next stay. 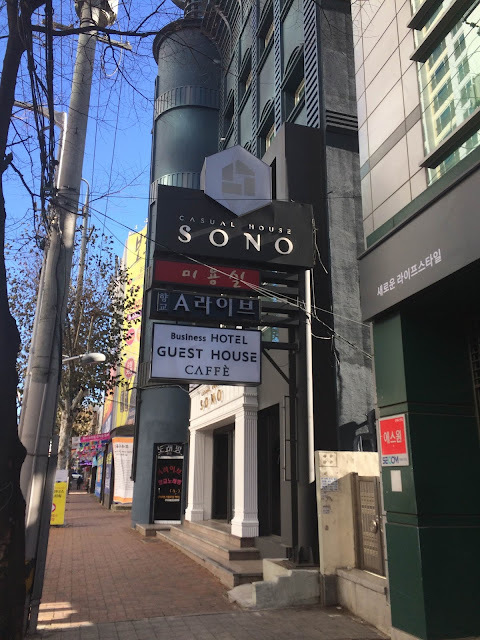 The name of the hostel is Casual House Sono. 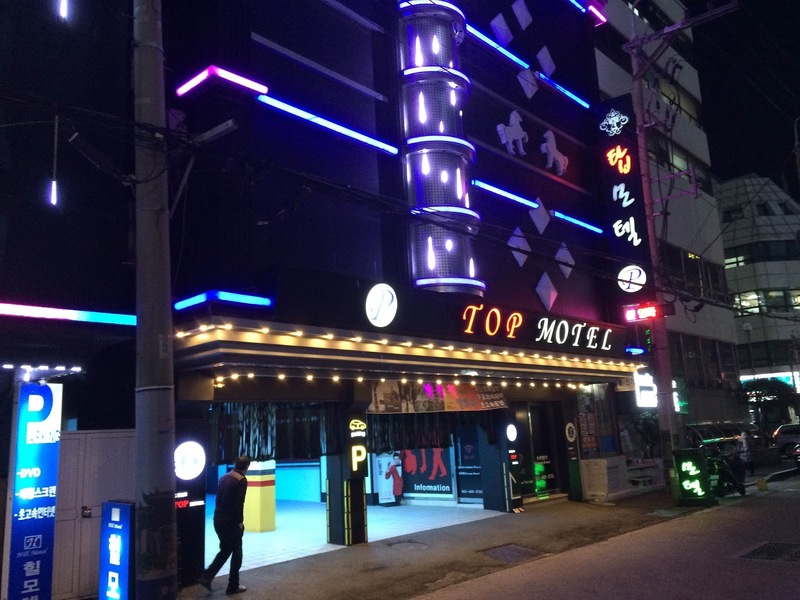 I paid KRW 29,412 or P1,297 for a one-night stay at a bunk bed in male (4) dormitory room. 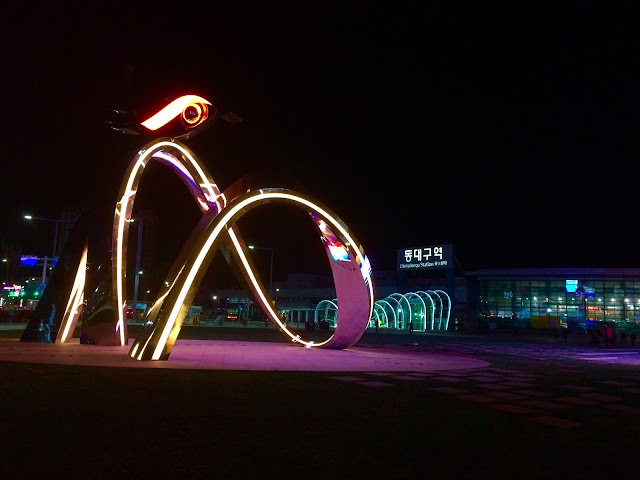 After my check-in, I saw the opportunity for a Daegu City Tour and immediately went to the Station 1 in Dongdaegu Station and paid KRW 5,000 for the 14-stop tour. I had to choose from the 14 stops and I chose Gyeongsang-Gamyeong Park and Jongno. I was planning to visit the other stops but due to limited time, I had to end the tour. Tip: Some of the stops can be viewed from inside the bus and you can also take pictures from inside the bus. The Suseongmot Lake and the Gukchae-bosang Memorial Park are some of the best stops. 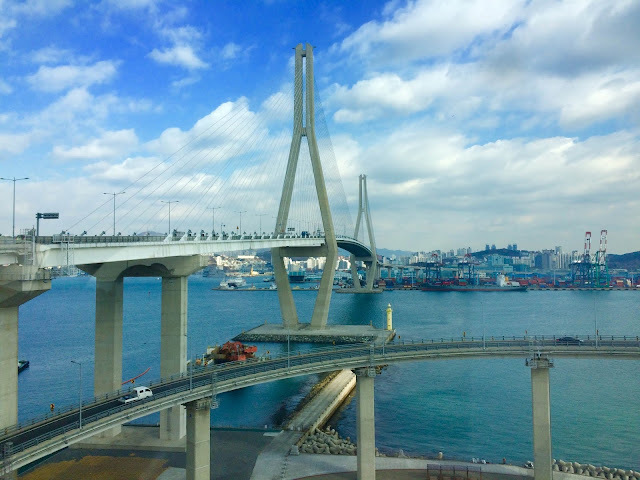 If I will be given another chance to have this city tour, I will try to finish all the stops. Trust me, the stops are great! 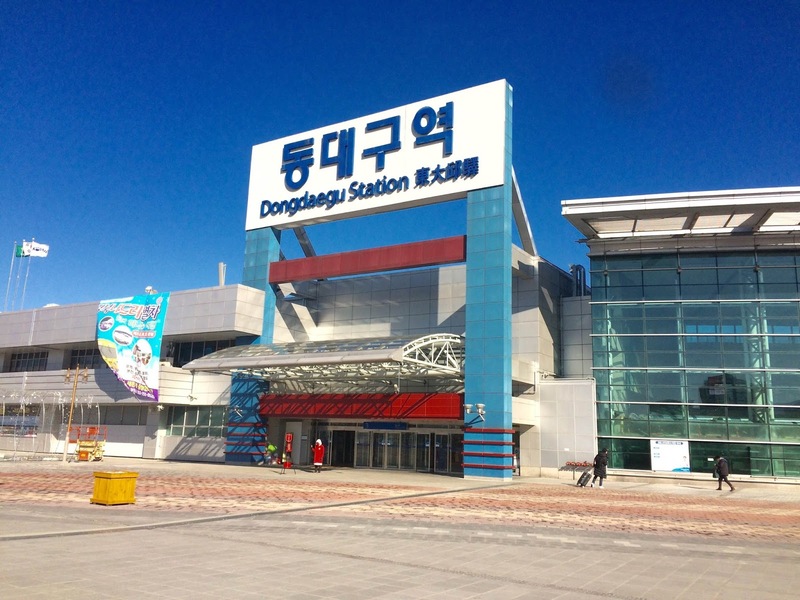 Finally, past 6 pm I arrived back at Dongdaegu Station. I had to see the two other stops that I missed the previous day. Again, I paid KRW 5,000. 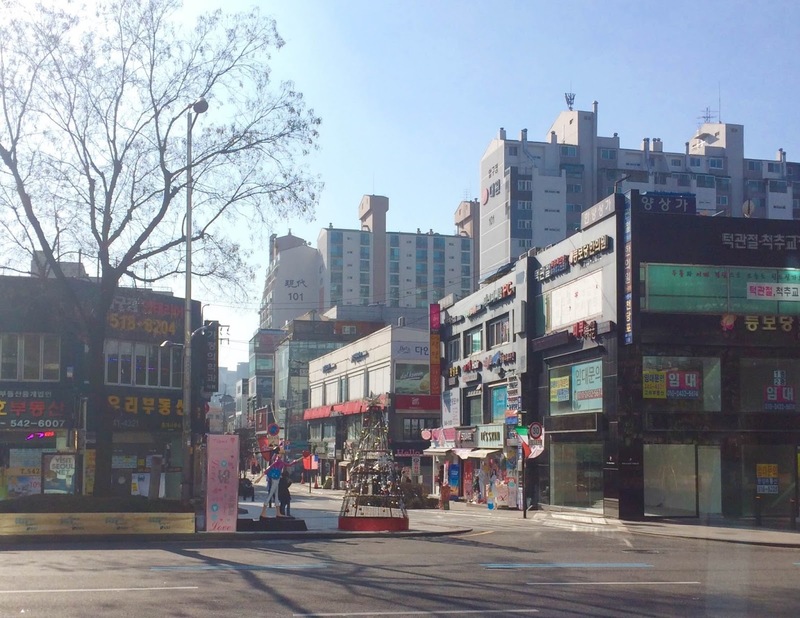 After seeing the Seomun Market and Dalseong Park, I boarded the bus and went to the Stop No. 10 - Mt. Apsan Observatory. Reaching Stop No. 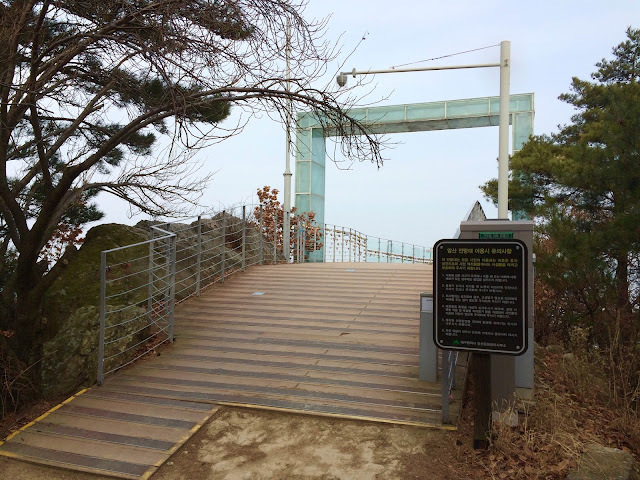 10, I hiked for 19 minutes and reached the observatory. 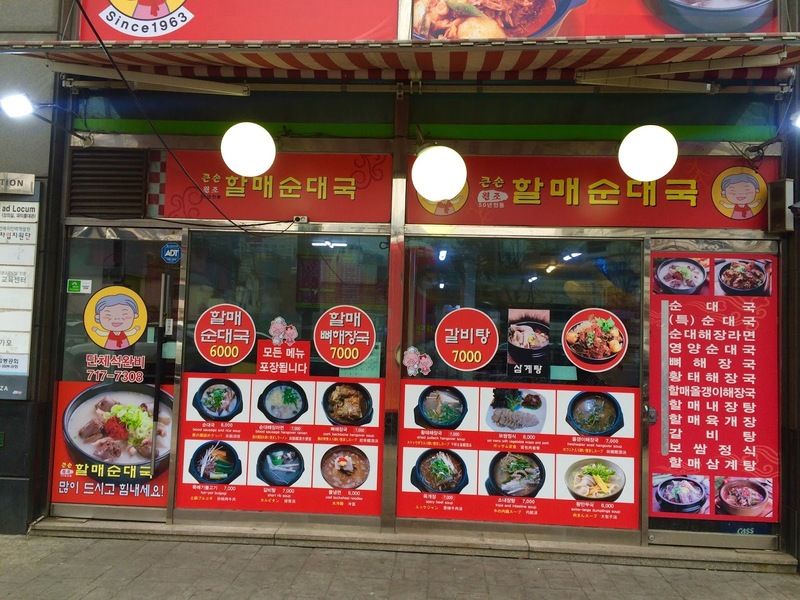 Fare was KRW 7,200. 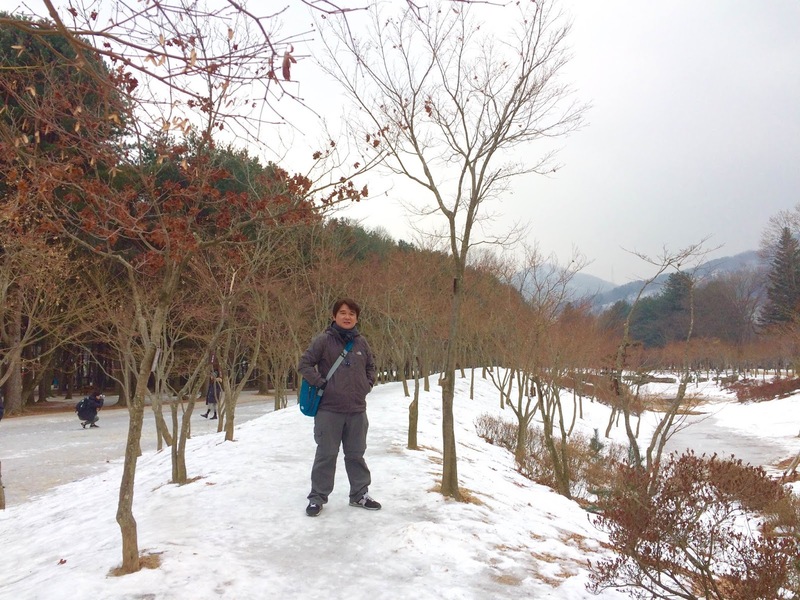 It was very cold at the top of the mountain (probably -2) when I was hiking. 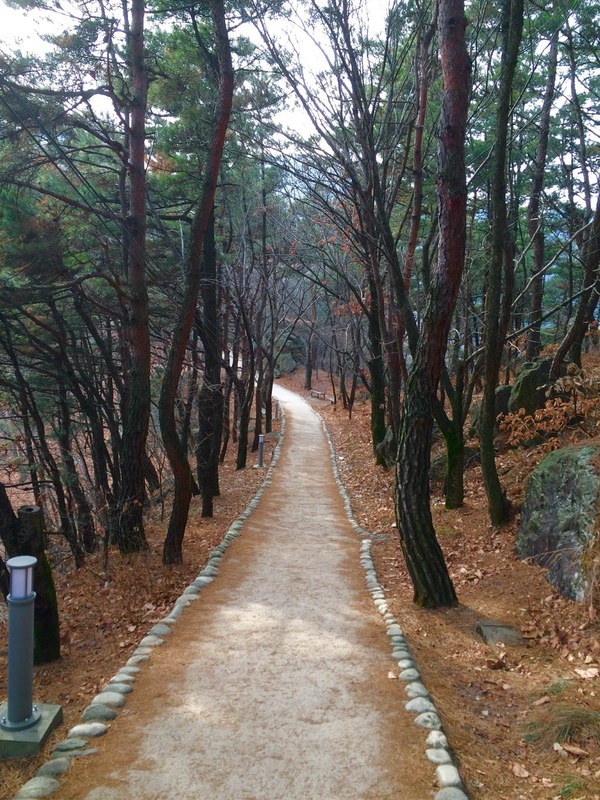 I could not feel my feet but I continued walking. After 300 meters, I reached the observatory. From the top of observatory, you can see the entire Daegu. After the tour, I immediately went back to the hostel, got my bag went to Seoul. Again, I used the fastest transport, KTX! 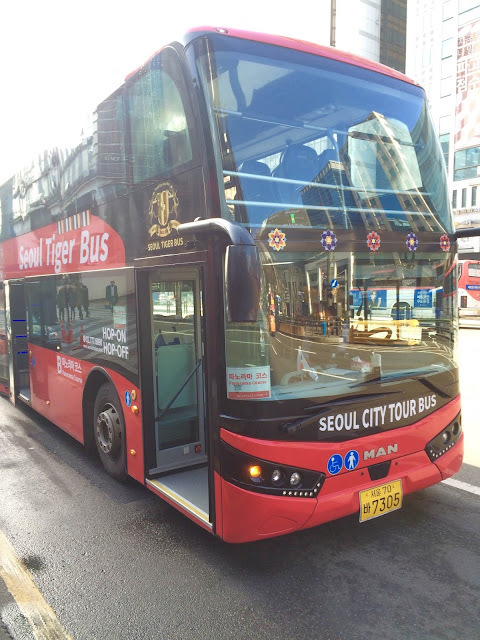 Travel time from Dongdaegu to Seoul is only 1 hour and 45 minutes and fare was KRW 43,500. 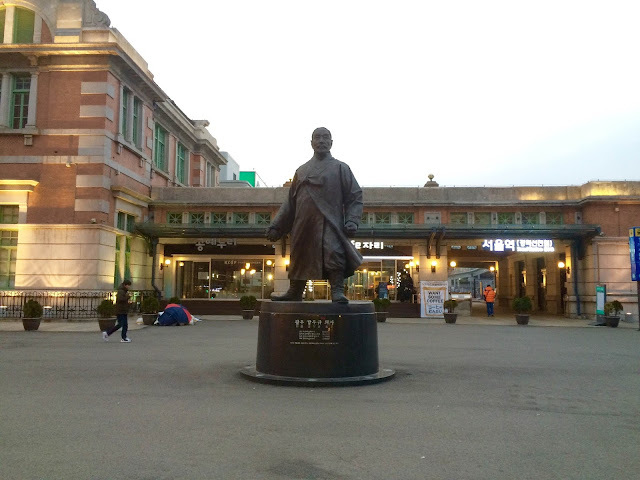 From the Seoul station, I had difficulty finding the hostel but I managed to find it after several attempts. This will be my place of stay for 4 nights in Seoul. 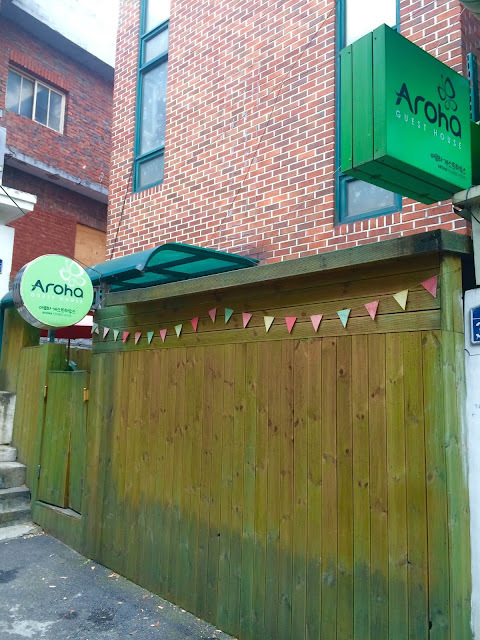 Total fee for four nights is KRW 147,000 or PhP7,350 in Aroha Guesthouse Hostel. Best way to end the day is to have the best meal. 1. LINE - There are nine (9) lines (subway). The Philippines has only 3 lines. Line 1 (blue) is the most convenient line to use and transfer. Each line has a different color. You have to know either the line number, color of the line or the name of the line itself. Know the end of the line. Just like in Manila for example, in LRT 1 the opposite ends are Baclaran and Monumento. 2. TRACK - Be very cautious on the track of the train in your ticket. 3. ENTRANCE/EXIT - Each line has its own entrance and exit. For Example, Line 1 has Exits 1-14. Each exit has a different destination. 4. You must have a reloadable ticket for your convenience. 5. There are several modes of transportation such as KTX, ITX, subway, monorail (in other cities) taxi and bus. 6. KTX is the fastest mode of transportation and the most expensive. 7. Outside the station make sure to read the sign of subway, taxi or bus when you fall in line. 8. Each station has an Information area and you can ask for direction. You can have it put in writing (ask politely please). For example, what exit, what line, how many transfers, how many stops or station. 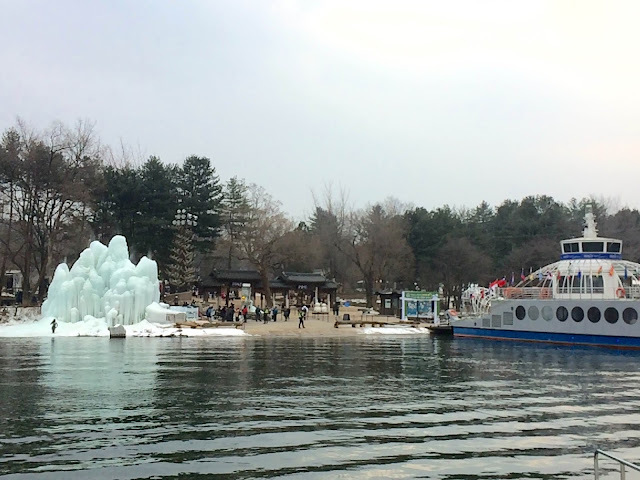 There are 3 ways of going to Nami Island, namely: (1) by bus, (2) by ITX or (3) by local train.The bus is the fastest, most convenient, and the most expensive and you have to make reservation. ITX is the second most convenient. And the local train is the cheapest and the most difficult. I used the ITX and paid KRW 5,200. 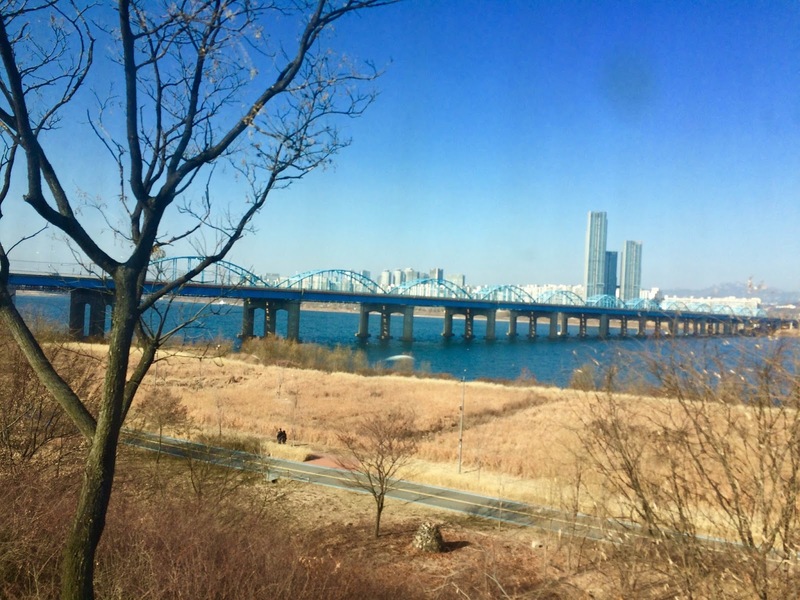 Take the Metro to Yongsan Station. 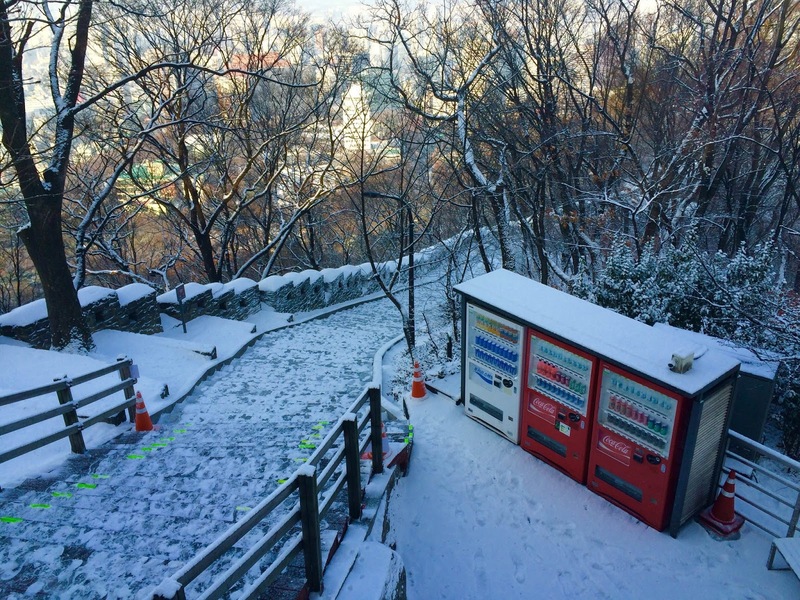 From Nami Island Station, walk to Gapyeong Wharf (2 minutes). 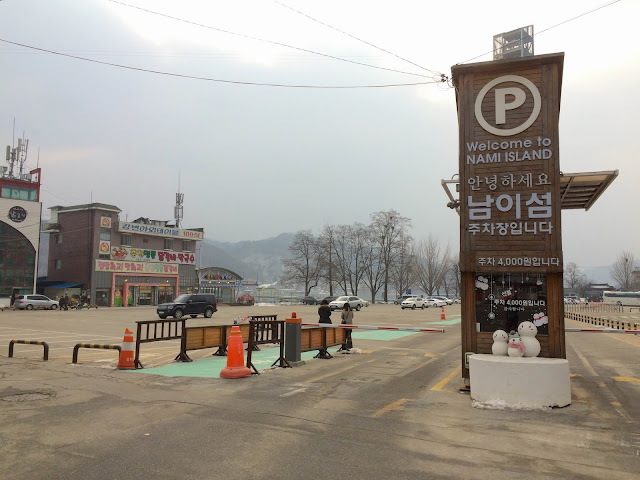 Pay the Nami Visa and board the Jetty to the island. 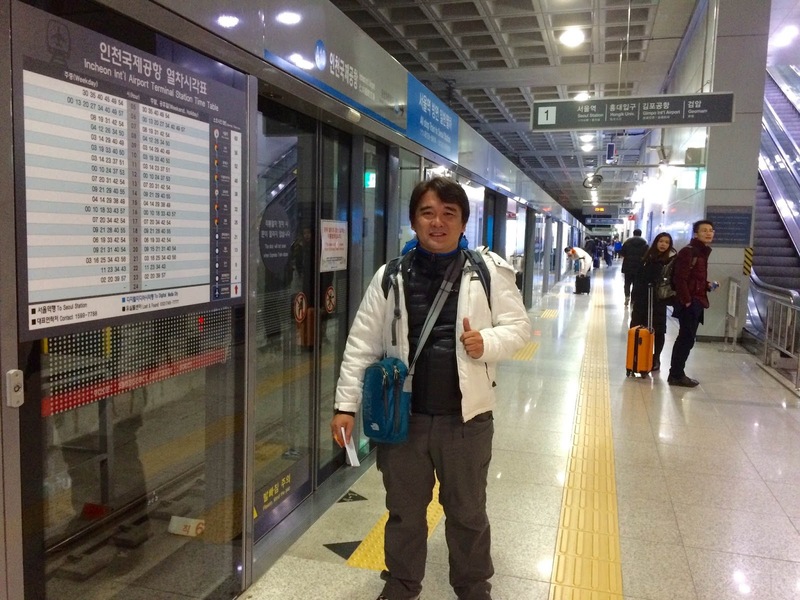 From Seoul Station, I boarded the subway using Line 1 and alighted at Yongsan. 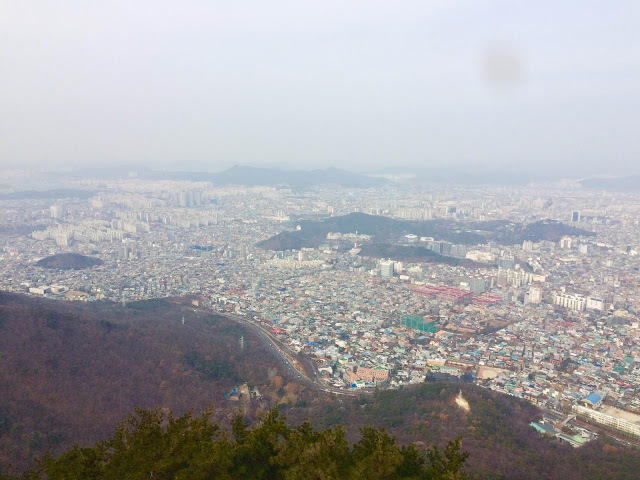 From Yongsan, boarded the train Gapyeong. 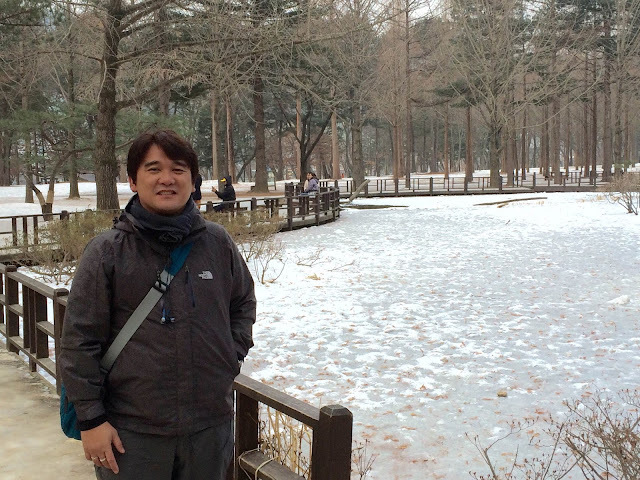 Reaching Gapyeong Station, I boarded the taxi and paid KRW 3,000. After 5 minutes, I reached the port and paid the entry visa worth KRW 8,000. After 5 minutes, we arrived at the dock. After Nami Island, I went back to Seoul. I was trying to find the market and ended up somewhere else. 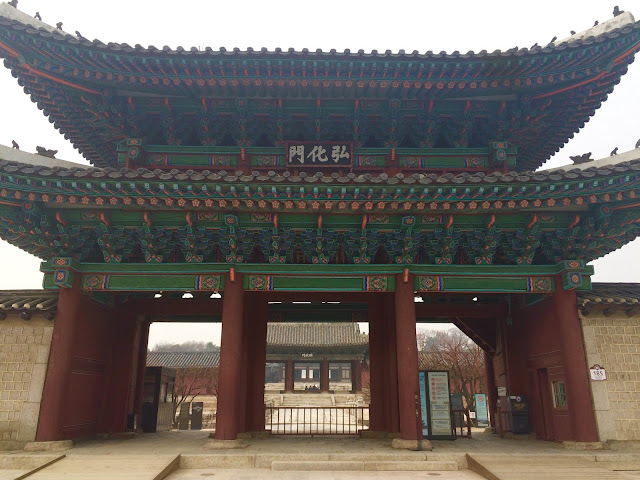 Sometimes it pays to be lost since I had the chance of seeing the Sungnyemun Gate! 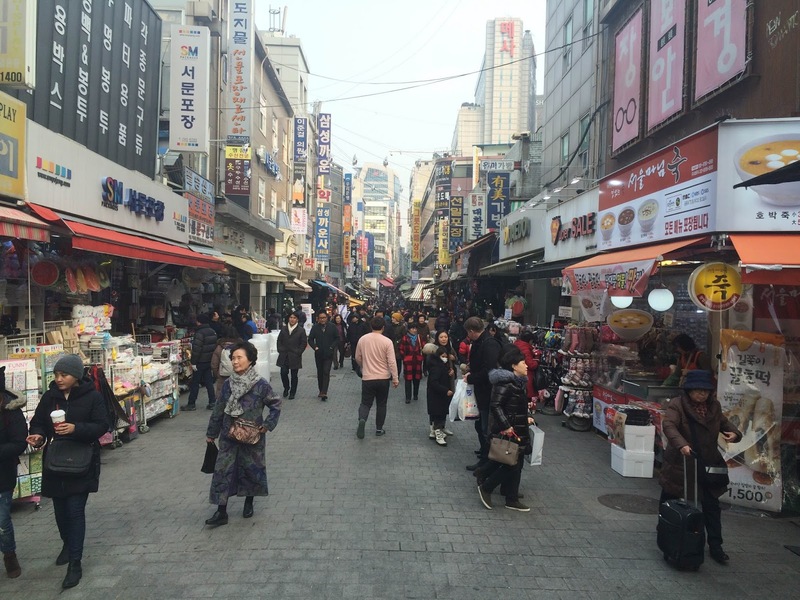 Last stop for the day was in Namdaemun Market. 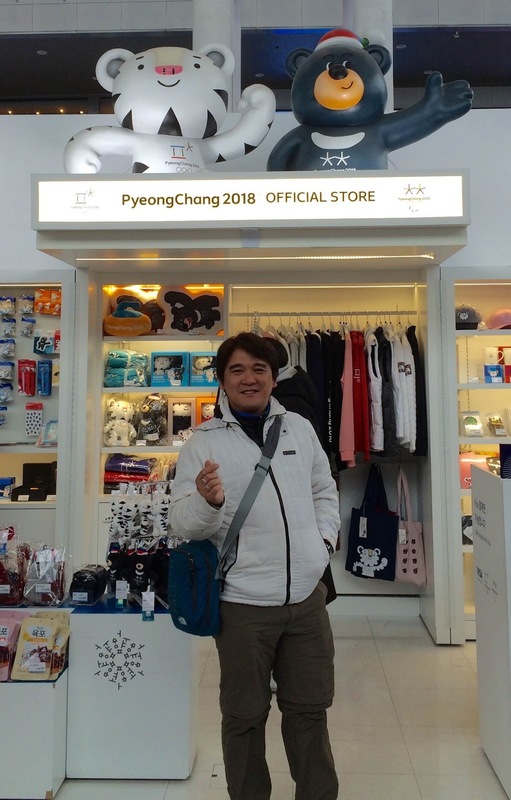 Best place in Seoul to buy your souvenir items. I bought my personal accessories and some "pasalubong." 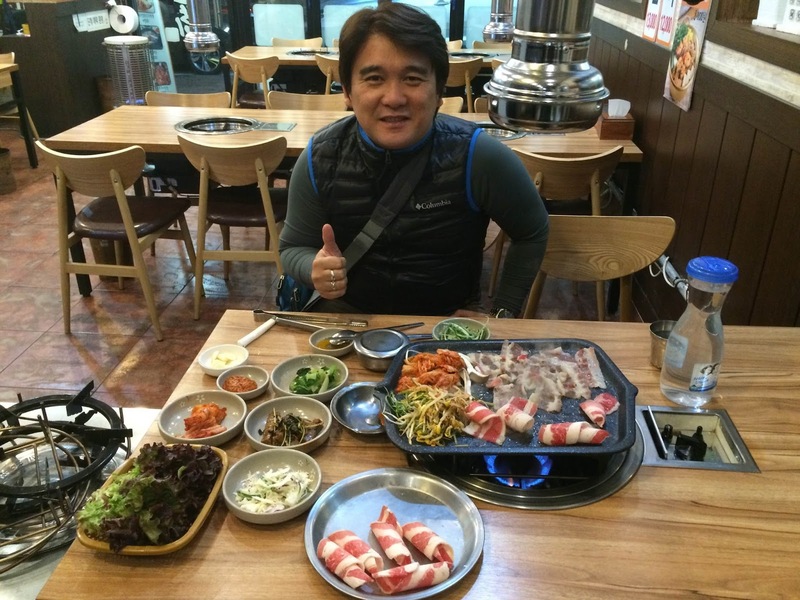 The best way to end the day is to have a sumptuous dinner at the same market! Early the following morning, I woke up early, fixed myself, and headed to my destination. 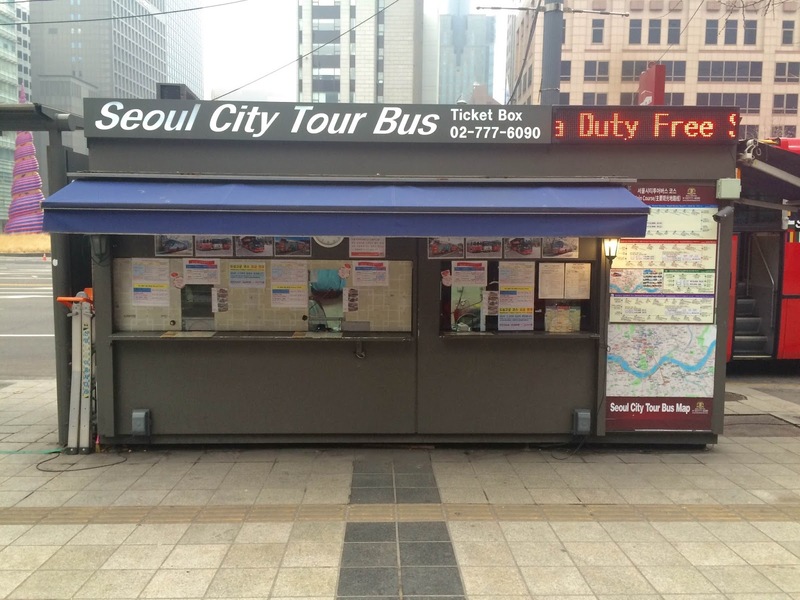 Again, I asked for directions and after 2 lines, I was able to reach Gwanghwamun Station. 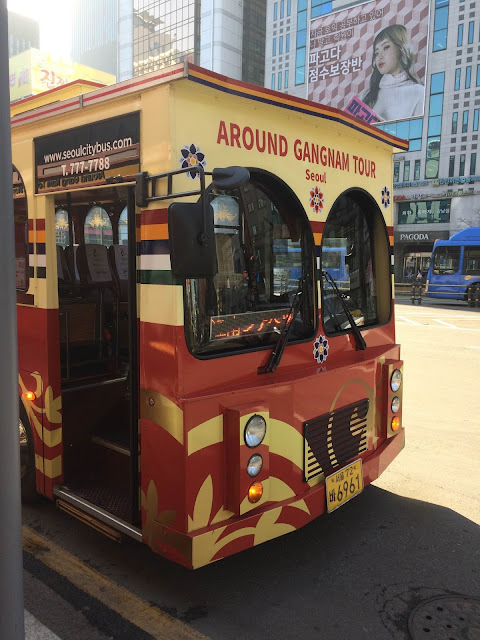 I had to chose among the 4 tours the Seoul City Tour has to offer (There is another tour by the way named Sightseeing Tour). There is an online reservation. But you can do this tour without any reservation provided that you pay either in Gwanghwamun Ticket Booth or in Seoul Station Stop. 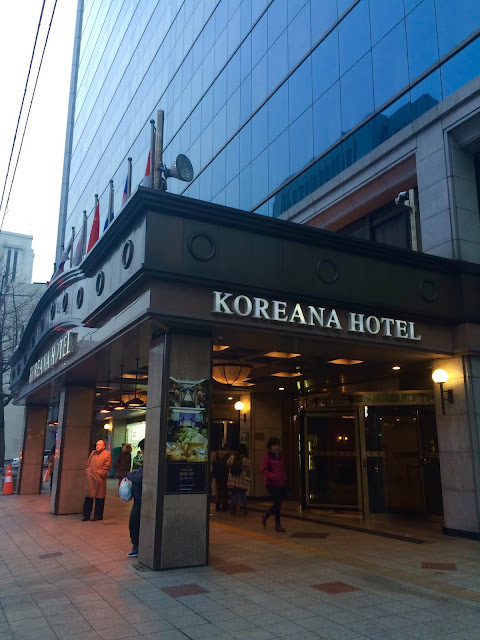 In case you are lost, try to find the Koreana Hotel and the ticket booth is just beside the hotel. The ticket booth opens around 8:45 am. 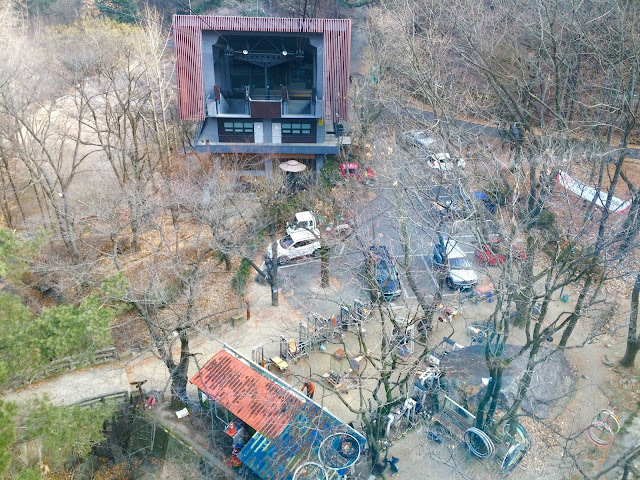 According to the sign, there are times when the tour is closed. 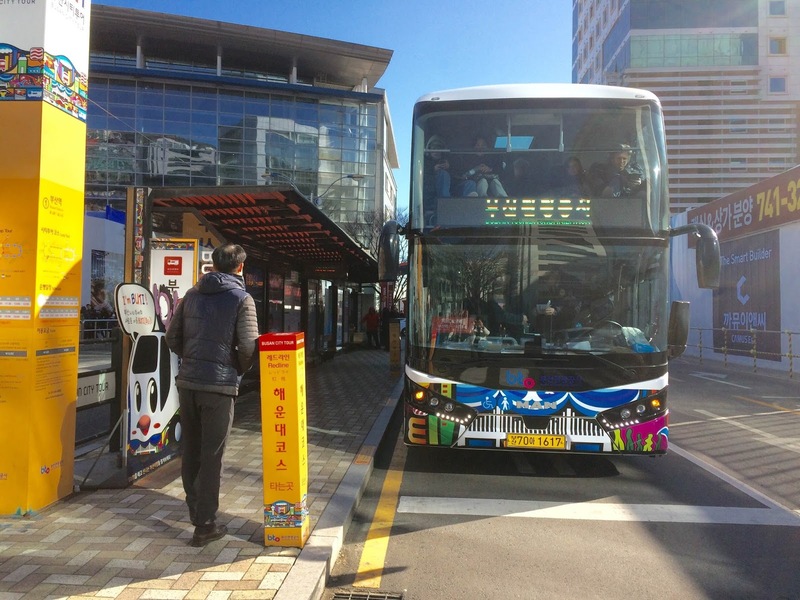 * Place in parenthesis are not boarding stops (bus simply passes by the place). * Departs once a day only. 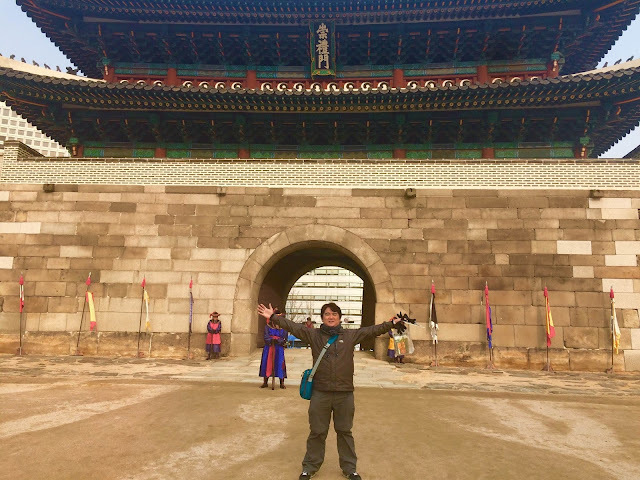 Among the 22 stops, I chose Museum of Korea, Hanok Village, Namsam Seoul Tower, Dongdaemun Market, Changgyeonggung Palace, Changdeokgung Palace, Gyeongbokgung National Museum and Palace. The bus comes in different forms. 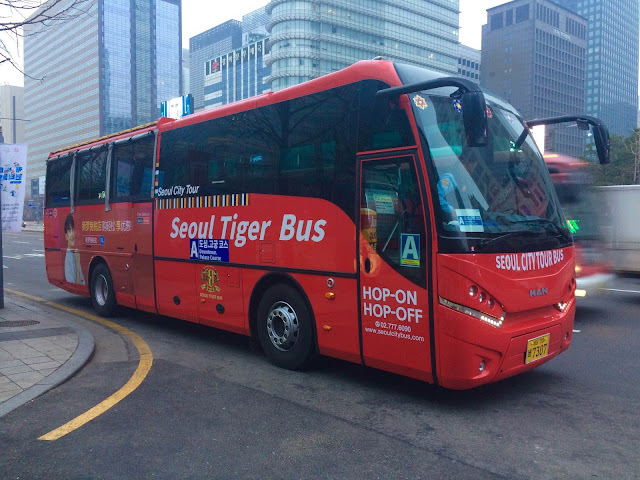 Please remember the sign Seoul City Tour Bus. Finally, the last stop for the day - Gyeongbokgung Palace. This is the best part and the most famous! This day commemorates the men and women who died while in military service or in the independence movement. 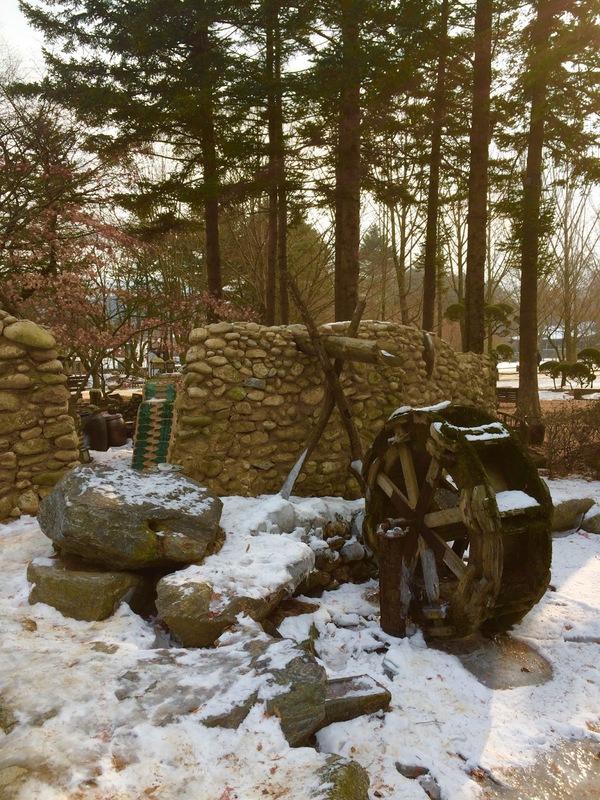 On this day, a national commemoration ceremony is held at the Seoul National Cemetery. The day celebrates the promulgation of the Constitution of the Republic of Korea in 1948. 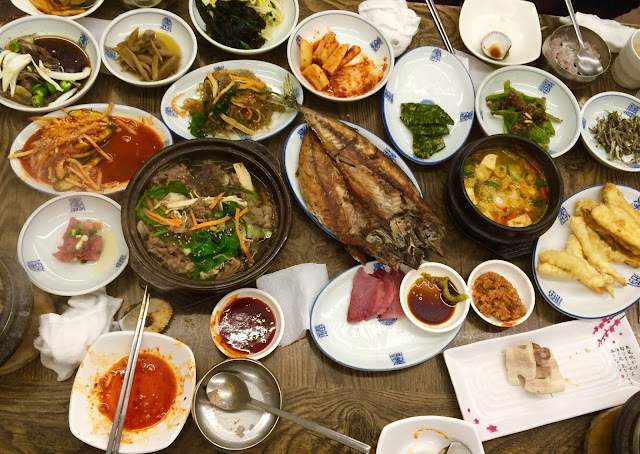 After the tour, I went back to Seoul Station and enjoyed the food in the city. Just meters away from the station are two best places to eat and enjoy the affordable food. 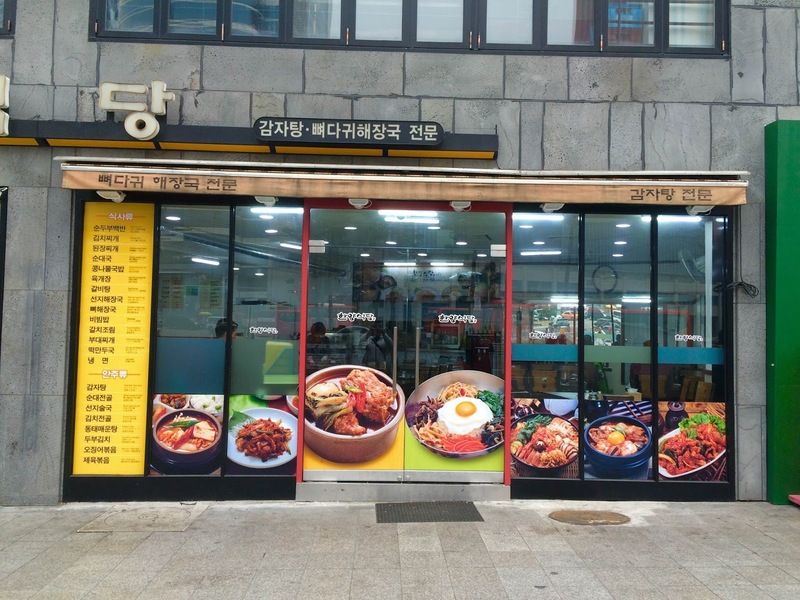 I do not know the name of the two restos since they are in Korean. After eating my late lunch, I went inside a Lotte Mall and found myself buying a souvenir for the PyeongChang 2018 Olympics. I have to take also the other tours i.e. 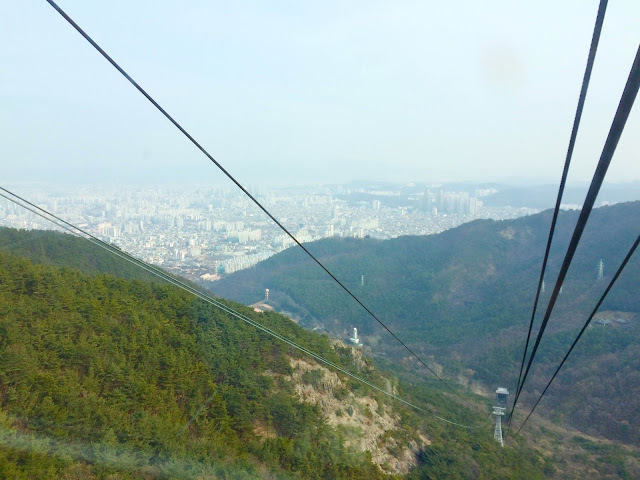 - Tour B and C.
Best place for Tour B is the Namsam Cable car. It snowed the night before my visit. This is what I do for a living - snow gathering! 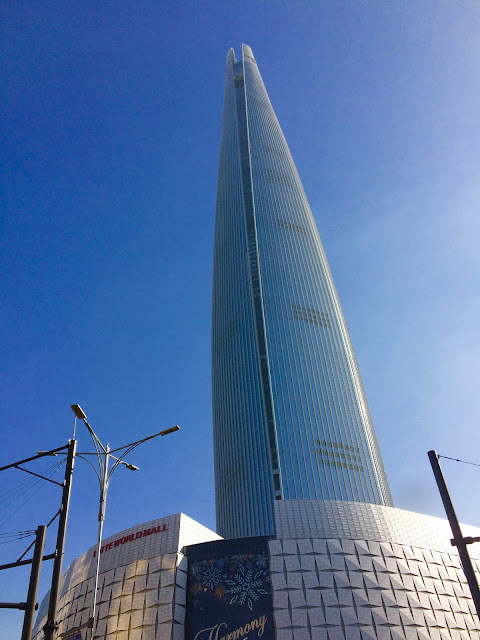 At the Gangnam Transfer Station, I changed to Tour C.
Best spot here is the 4th tallest building in the world, Lotte Tower. You can say that Gangnam is the Makati in Seoul. Also, the Olympic was a good spot to visit. 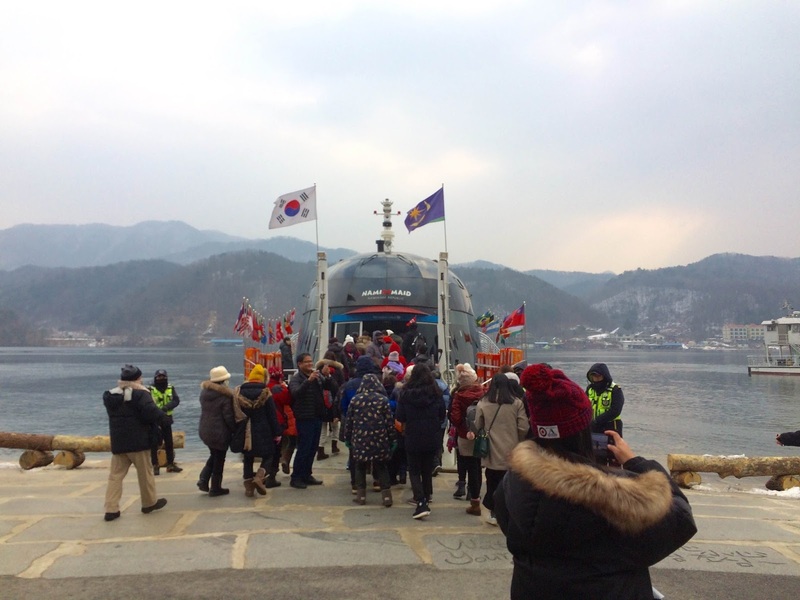 After the tour, I went home and my former student invited me to watch the New Year celebration at Jonggak Station. 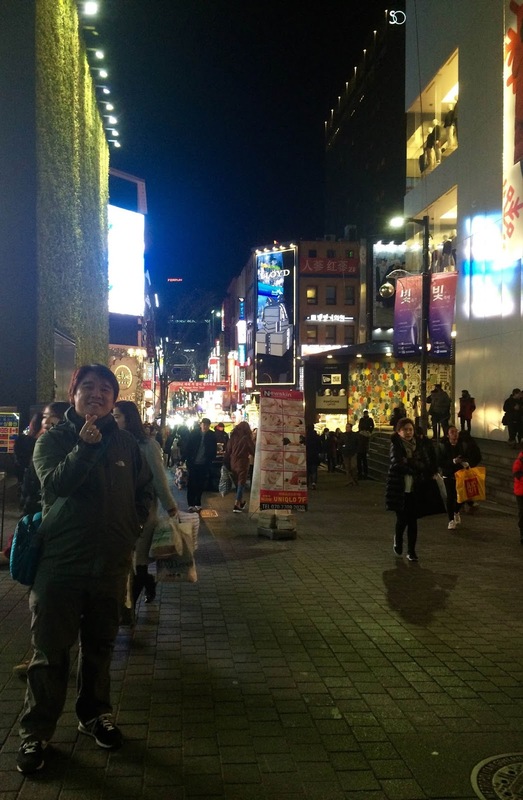 But before the fireworks, we went to Myeongdong DongDaemun Market. Did a bit of shopping for my nieces.